yadav history - Why be Hindu? Hinduism is, basically, the modern name for the Vedic way of life, especially the spiritual path usually associated with India. Previously, those who followed the Vedic system were also called Aryans. 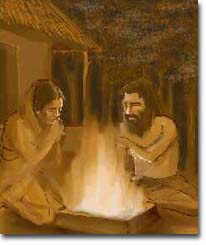 It is often considered that the Vedic Aryans were a race of people. However, Aryan actually means a standard of living, an ideal. It was the Sanskrit speaking people of thousands of years ago that gave the word arya to signify a gentleman, an ideal person, someone on the path of purity. 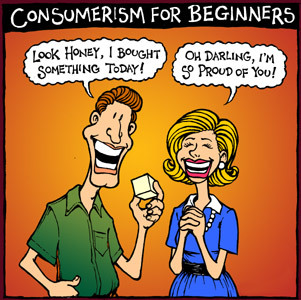 It was a term meant for those who were on the cutting edge of social evolution. Another way of interpreting the word aryan is that ar also means white or clear. Ya refers to God. Ya also refers to Yadu, or Krishna (Yadav). Thus, aryan means those who have, or are developing, a clear path or a clear consciousness toward God. 2. HINDUISM IS THE OLDEST LIVING CULTURE IN THE WORLD. 3. THE VEDIC LITERATURE IS THE OLDEST AND MOST COMPLETE SCRIPTURES FOUND ANYWHERE. It is agreed by any scholar of history or religion that the earliest spiritual writings that can be found are the Vedic samhitas, such as the Rig-veda. In History of Ancient Sanskrit Literature (page 557), Max Mueller observed, "In the Rig-veda we shall have before us more real antiquity than in all the inscriptions of Egypt or Ninevah. . . the Veda is the oldest book in existence. . ."
4. THE VEDIC PATH HAS A MOST DEVELOPED AND COMPLETE SPIRITUAL PHILOSOPHY. As we can see from the previous description of the Vedic scripture, the Vedic philosophy is the most extensive you can find anywhere. It covers so many aspects of life, both material and spiritual, that it is more comprehensive than any other philosophy or lifestyle that you can find. So many viewpoints on life, the material manifestation, God, and our spiritual nature have already been thoroughly considered and thought out that there is little, if anything, that the Vedic philosophy has not already dealt with and spoke about. Everything is there, more of which than most people are aware. Because of this it has attracted thinkers and philosophers from all over the world and from all points in time. The West in particular has, and still does, look to India for the loftiest spiritual knowledge, and for what the churches or synagogues have not delivered. This may include practical spiritual guidance in self-discovery, an integrated world view, spiritual and emotional fulfillment, and even true mystical or spiritual experiences. The spiritual processes that are explained in the Vedic teachings go far beyond the conventional idea, as presented by most religions, that people should merely have faith and pray to God for forgiveness of their sins in order to be delivered to heaven. Naturally, we all have to be humble before God. That is what is encouraged and developed. This is especially in the loving devotional path, wherein a person can purify his or her consciousness through the spiritual practices that are fully explained in the Vedic teachings, even though this takes time and serious dedication and sincerity. 5. THE VEDIC LITERATURE OFFERS MORE INFORMATION ON THE SCIENCE OF LIFE AFTER DEATH, KARMA AND REINCARNATION. Sure, all religions indicate there is life after death. 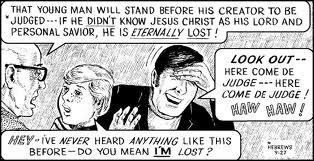 However, they normally offer only the most basic understanding that if you are good and a believer, maybe you will go to heaven. 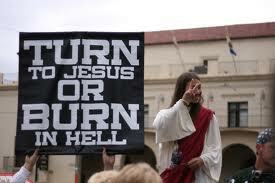 And if you are predominantly bad, you will go to hell. But only the Vedic philosophy offers detailed information on how exactly this works, and how we create our future with every thought, word and deed. And how that future may not only be in a heavenly world or on a hellish planet, but how it can be another life similar to what we are experiencing now on this earthly globe. After all, we can look around this planet Earth and see that some people live a nice heavenly existence. They may live in beautiful weather and landscapes, in pleasant surroundings, and in a lovely house, with plenty of money, etc. While someone else may live in a country torn by war, with famine and drought all around, dealing with disease and poverty, and so on. 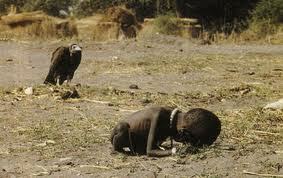 A Vulture waiting for the child to die, so that it can eat him. Or we can see that even within the same family, someone may be born and become educated, wealthy and accomplished, while a sister or brother may be born blind, deformed, uneducated, and grow to have a hellish life filled with difficulty. Why is there such a difference? The fundamental religions may give only basic answers, like it is the will of God. Yet the Vedic knowledge can go into great details to explain how such occurrences are arranged by nature to provide the necessary facilities for each individual to have what he or she desires and deserves according to their past actions, words and consciousness. 6. THE VEDIC PHILOSOPHY OFFERS A MOST COMPLETE UNDERSTANDING OF GOD AND THE SPIRITUAL DIMENSION. In all of the religious books one can gather, you will find nowhere else but in the Vedic texts such a complete description of the Supreme Being and the spiritual dimension. Nowhere else is the understanding given that God is an impersonal force (the Brahman effulgence, in which God displays His potency of existence/eternality), as well as Paramatma, the localized incarnation known as the Supersoul in everyone's heart (in which God displays His potency of existence and knowledge), and, ultimately, Bhagavan, the Supreme Personality who creates this world and overlooks all things (in which God displays His potencies of existence, knowledge and pleasure pastimes). Nowhere else is there offered such a complete understanding of all aspects of God, from His impersonal characteristics to His individual and supreme nature. Furthermore, nowhere else are there such elaborate explanations of the spiritual world and what goes on there, or how we can truly enter that region, and what the areas are that surround the cosmic creation. Also, nowhere else can you find such detailed descriptions of how the universe was created. Often you will find in a scripture a simple allegory for people to believe that gives only the slightest ideas of how the worlds were created. But in the Vedic literature, there are complex explanations of how and when things took place in order to manifest the universe as we see it now. 7. HINDUISM AND THE VEDIC LITERATURE HAS MANY DIRECT WORDS AND INSTRUCTIONS FROM GOD. The Vedic literature is filled with stories and conversations of instruction, and many of those instructions are given directly by God or one of His many incarnations. Other spiritual paths may provide a few commandments that are said to be given by God, or books given by His representatives or prophets. And these certainly can be helpful for the guidance of mankind. However, no where else but in the Vedic scripture do we find such a collection of direct instructions given by Lord Krishna, Lord Vishnu, or the Lord's other forms that direct us in explicit methods of reaching spiritual realizations and perfection. 8. THE VEDIC PATH OFFERS THE MOST LOVING AND BEAUTIFUL FORMS OF GOD. Not only does the Vedic literature describe the innumerable aspects of God, but also relates the knowledge of the numerous incarnations and forms of God. 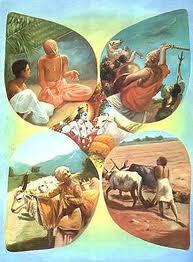 In these incarnations He performs innumerable pastimes for multiple purposes. Out of all these, which are completely spiritual in nature, we find such beautiful attributes and forms as Lakshmi and Vishnu, or Sita and Rama, and Sri Sri Radha and Krishna as the most sublime. In fact, the forms of Radha and Krishna have been described at length for Their superb qualities and features of incomparable beauty. Plus, the depth of Lord Krishna's loving nature and pastimes with His closest associates is like none found elsewhere. There is no other culture or spiritual path that has any such knowledge of God, or that can present such loving and beautiful forms of God who displays such deep and nectar-like pastimes and personality. Therefore, the Vedic process offers the deepest insights into the most confidential forms and loving disposition of the Supreme Lord. These pastimes often cannot be understood by those who view the Supreme as an angry and jealous God, as some religions do. They do not know the more sublime nature of spiritual relations with the Supreme because there is no information about it found elsewhere. 9. THE VEDIC CULTURE HAS SOME OF THE GREATEST SPIRITUAL TEACHERS AND MASTERS THAT YOU CAN FIND. In any of the authorized sampradayas, or lines of disciplic succession, you can find greatly learned and fully realized spiritual masters. These lines of gurus and disciples include the Brahma, Sri, Shiva or Kumara sampradayas. In these lines, the highest levels of spiritual knowledge has been carefully handed down from person to person, guru to disciple. Therein we have received the blessings and elaborate instructions from such teachers, as well as witnessed their lifestyle and numerous miracles, as some people would call them. The histories and biographies of such saints and teachers show their ability to affect others, and provide examples of how some have entered directly into the spiritual dimension, or even communed with God on a regular basis. 10. VEDIC CULTURE OFFERS A MOST DIRECT PATH TO PERSONAL SPIRITUAL REALIZATIONS AND ENLIGHTENMENT. The Vedic process, Sanatana-Dharma, directly teaches what is the spirit soul and what are your spiritual nature and position. Such teachings are easily found in the Bhagavad-gita and other important Vedic scripture. It then provides the system which engages you in the activities that awaken your perception of this. The key is that it prepares your consciousness, through various practices, to operate on higher levels of reality, and ultimately on the spiritual strata. This increases your awareness and allows for the ability to perceive the higher planes of existence that pervade this multidimensional universe. In this way, the more spiritual you become, the more you can detect that which is spiritual. Through this means of continual development, spiritual life no longer remains a mystery, but becomes a reality to experience. This is why Lord Krishna says in the Bhagavad-gita that this spiritual knowledge of the Vedic system is the king of education, the most secret of all secrets, and the perfection of religion because it gives direct perception of the Self, the soul, by realization. It is eternal and joyfully performed. 11. BECAUSE HINDUISM IS ONE OF THE MOST EXPRESSIVE PATHS, IT IS ALSO ONE OF THE MOST EMOTIONALLY FULFILLING. There are some religions that make no hesitation about stifling music and other forms of art because they think that it is too sensual. Others simply may not utilize much of it except in songs. However, the ancient Vedic path incorporates many forms of self-expression. The idea is that it can be used in the service of the Supreme, and, thus, becomes a means for focusing one's attention and consciousness on God. Thus, it becomes a spiritual energy and a tool for expressing and raising one's devotion to the Lord. 12. 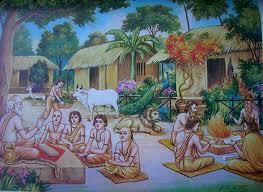 HINDUISM, VEDIC CULTURE, OFFERS A SCIENTIFIC WAY OF LIFE, FROM DIET, LIFESTYLE, DAILY SCHEDULE, ETC. With all the topics that are covered in the Vedic scripture, it provides the means for a most well-rounded and balanced lifestyle, both materially and spiritually. For example, in regard to meditation, it recommends that the best time to do so is in the early morning during the brahma-muhurta hour, which is just before sunrise. Why? Because this is best since it is before the business and noise of the day begins. It is just after getting rest, arising during the time when satya-guna, the mode of goodness, is prominent, and before the mind is disturbed by so many thoughts of the day. 13. ANYONE IN ANY POSITION CAN BE A HINDU AND PRACTICE AND BENEFIT FROM THE VEDIC TEACHINGS. It does not matter whether one is in a high class or low class position, wealthy or poor, educated or uneducated, old or young, man or woman, anyone can plug into some portion of the Vedic teachings and participate. This will benefit one in any number of ways. If one wants to be healthier, happier, more peaceful, more enlightened spiritually, a person can find that the Vedic path can do this. 14. THE VEDIC PATH VIEWS ALL RELIGIONS AS TRUTH, OR PORTIONS OF THE ONE TRUTH, AND WAYS OF SPIRITUAL DEVELOPMENT. There is no discrimination toward other religions in Hinduism. Hinduism views all authentic religions with a potential to raise the consciousness of its followers to a higher level of understanding God, themselves, and humanity. This is merely one of the beautiful aspects of Hinduism; that it provides the greatest latitude of diversity in the ways of understanding God. That is why you can mix Hindus with anyone, and they can peacefully coexist, just as you presently have Hindus, Buddhists, Jains, Sikhs, and others all living together peacefully. 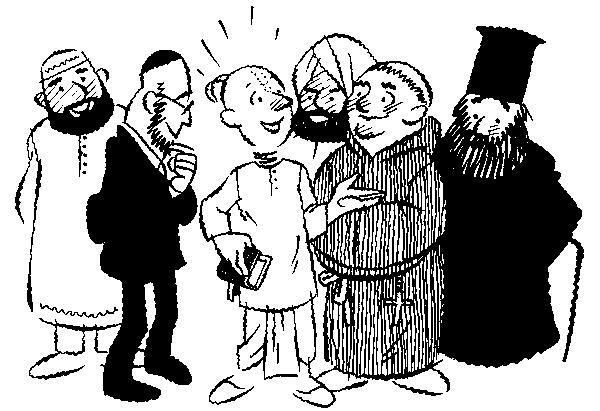 But as soon as you mix those of other religions who are dogmatic in their views, there is trouble. The reason is that there is no room for diversity of thought in such people. They think that in the eyes of God no one else is saved. They think they must "save" everyone by making everyone else just like them. 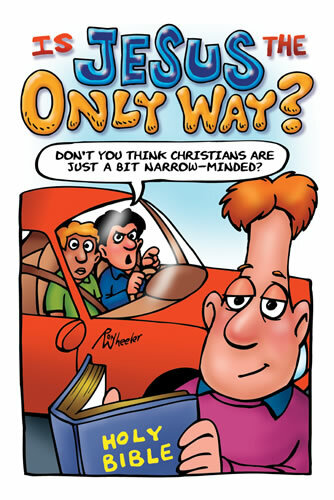 And the way that is done is by converting all others to their own dogmatic beliefs. Thus, they give no credence or understanding toward any religion but their own. 15. 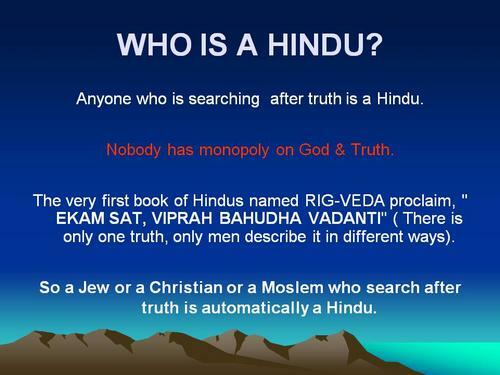 HINDUISM, VEDIC CULTURE, DOES NOT PRESENT GOD AS A HINDU, MUSLIM, CHRISTIAN, OR SIKH GOD. Since Vedic culture is universal in nature, it does not present a God in a regional theme, or belonging to a "chosen" people. Nor do we find God in the Vedic understanding to prefer a certain people. What you do find is a God who is loving to one and all, and especially to His devotees. What we find is a God who rewards one's love with love, according to their surrender and loving mood, regardless of region, race, or even species. 16. THIS IS WHY HINDUS, THE FOLLOWERS OF THE VEDIC PATH, CAN LIVE PEACEFULLY WITH THOSE OF OTHER RELIGIONS. Since Hindus in general, and those with a mature understanding of God as mentioned in the previous point, are more aware of the many different aspects of God, and see the same God in all religions, there is no friction between them and those of other distinct faiths. They can live peacefully with others without the need to feel that everyone else is doomed to hell, or must be converted to be "saved." Hindus recognize the same God though worshiped in many ways. Thus, what is the difficulty? 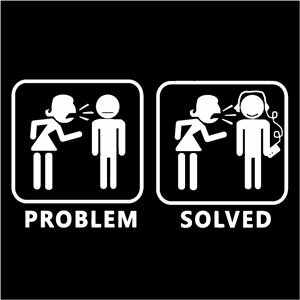 There is no problem. This is true of sincere worshipers of any religion. A sincere and mature Christian can easily get along with a sincere Hindu, who can easily get along with a sincere and mature Muslim, who can get along with a sincere Sikh, Buddhist, and so on. 17. 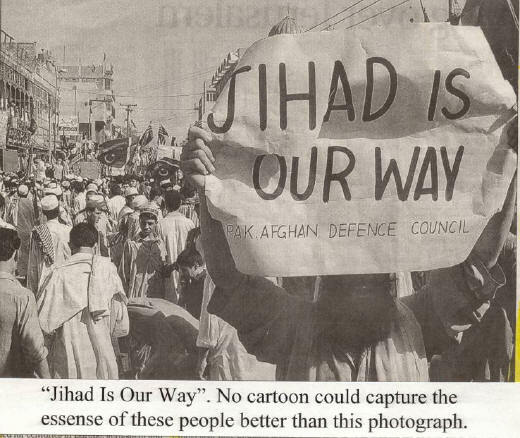 HINDUISM HAS NO CONCEPT OF JIHAD, HOLY WARS, CRUSADES, OR MARTYRDOM ON ITS BEHALF. Unlike other religions that tend to be extremists or exceptionally dogmatic in its views, Hinduism, or Vedic culture, has no concepts that relate to being a martyr, as found in Christianity, or the Islamic jihad. These are not ideas that make much sense to the Hindu. Why? Because for Hindus spiritual life is not about fighting others for the supremacy of one religion over another. Hinduism treats all religions with respect because it has its own sense of security and strength in its approach to God, which is the hallmark of a mature spiritual path. Religion and any spiritual process is to help an individual better understand who he is and what is his or her relation to God, and what is his purpose in the universe. If a person is truly trying to progress in this way, then of what purpose is there in participating in a holy war, or to die becoming a martyr for a cause fighting against another religion? This is not the purpose of any spiritual path. This is why there is not much discussion in the Vedic literature to demean other religions, nor is there any campaign against any so-called "false gods" as you find in the more rigid or dogmatic religions. 18. FOLLOWERS OF VEDIC PHILOSOPHY DO NOT TARGET OTHERS FOR CONVERSION. Hindus do not take it upon themselves to convert others to Hinduism. 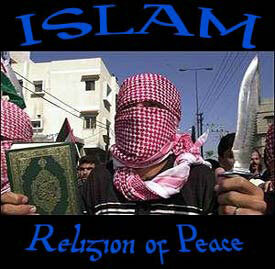 They never target a certain religion or faith to be subject to their criticism or attempts to be converted to Hinduism. They feel that the focus of any spiritual path should be on God, not on making or accumulating converts like some network marketing scheme that counts profits in terms of the quantity of followers it has. The effort should be in giving high quality spiritual education and, thus, by purity, inspire others to go toward God. 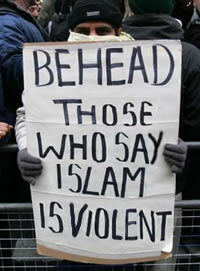 Therefore, they have no motive to spread hate or lies or discord amongst any other community or religion. 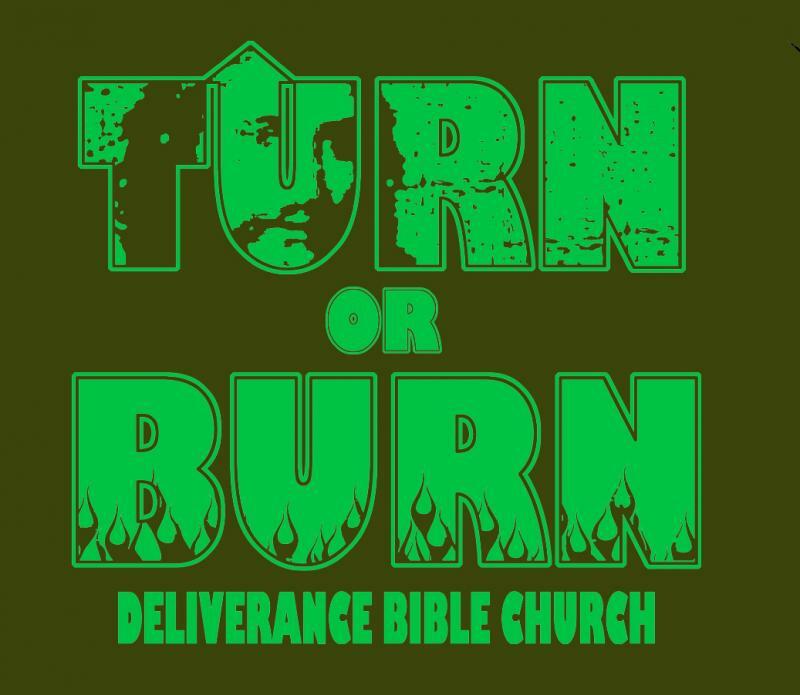 On the other hand, it is seen that Christians often view Hindus as pagans or heathens, meaning, in essence, that they are Godless and doomed to hell, and must accept God in the form of Christianity in order to be "saved." 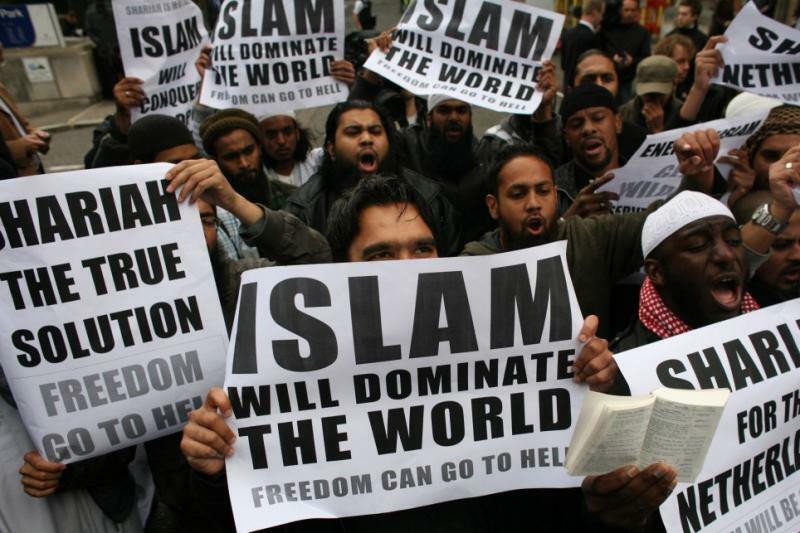 Muslims also view Hindus as idolaters or polytheists, and thus damned per the descriptions of the Koran, or so they say. 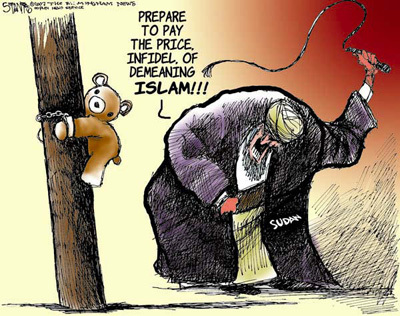 Yet, Hindus are free from any such doctrine or attitude toward Islam or Christianity. Nonetheless, when Hindus begin to react to this constant criticism of their religion by such dogmatists, it is primarily an angry backlash and a defense of their culture rather than an attempt to start friction or trouble with those of other faiths. After all, how long can Hindus continue to be as tolerant as they have been toward those of other religions who are so aggressive in their attempts to make converts and who take advantage of this tolerant attitude? It should be expected that sooner or later Hindus will no longer tolerate this never ending bombardment of propaganda against Hinduism that is used to sway more people toward misunderstanding what Hinduism or Vedic culture is in an effort to make converts. 19. 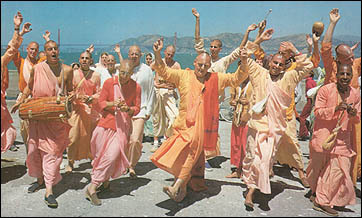 HINDUISM ACCEPTS THAT EVERYONE HAS THE RIGHT TO CHOOSE ONE'S OWN PATH TO ENLIGHTENMENT OR SALVATION. 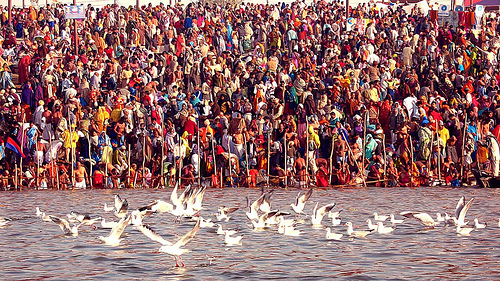 An example of this is the Kumbha Mela festival, which recently took place in Allahabad in January, 2001. 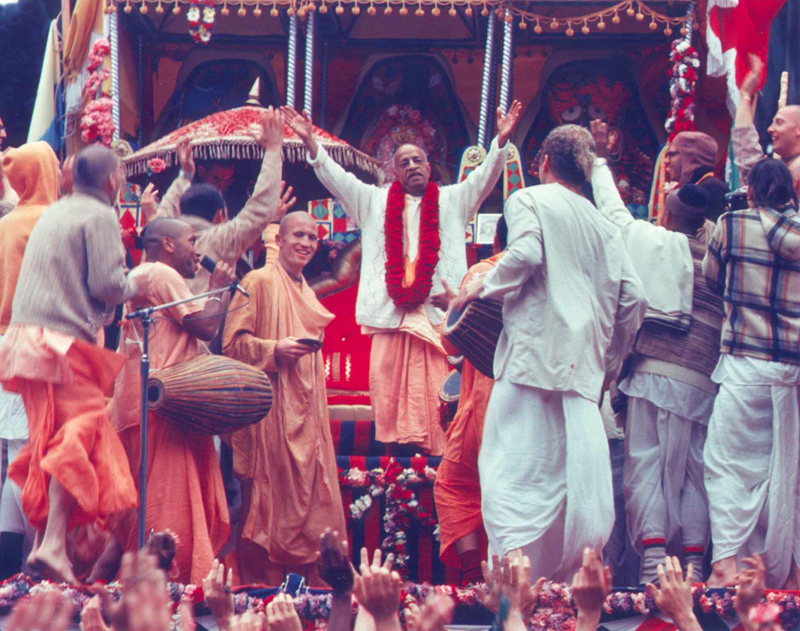 There were more than 71 million people attending through its duration, and 5,000 different ashramas or schools of philosophy at the festival, all with similarities with one another, yet with particular distinctions as well. Yet, they all got along and cooperated and respected each other in their participation of this holy festival. You cannot find such a huge gathering amongst those of any other religion. 20. HINDUISM OFFERS A UNIVERSAL GOD AND CONSCIOUSNESS, BEYOND A MERE LOCAL TRADITION. 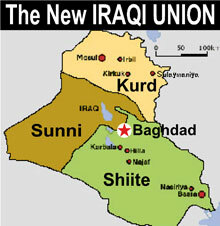 Often you find a religion based on the history, background and needs or development of a regional people. But in the Vedic culture we find a universal history not only involving the people of India, but other areas of the world, as well as other planets and different dimensions of the universe. Thus the spiritual teachings that the Vedic philosophy provides are universal, for all living beings. 21. HINDUISM PROMOTES SEEING GOD IN ALL LIVING BEINGS. Without a doubt, the Vedic scripture provides descriptions and narrations meant to help one increase his or her awareness of God in all beings. Anyone who studies the essential Vedic texts will soon see a difference in his or her recognition of how God is within everyone, accompanying the jivatma (individual soul) as the paramatma (Supersoul). You will never find anywhere else the information on the Supersoul as we find in the Vedic texts. This information helps us see the Divinity within all living beings and how everyone is a part of the Supreme in spiritual quality. Such an awareness and perception will naturally increase our respect and concern for all living creatures. We will realize that all life is sacred. We will more clearly understand how our love for God will be exhibited by how much we care and cooperate with others. 22. IN HINDUISM YOU CAN ASK ALL THE QUESTIONS YOU WANT WITHOUT BEING CONSIDERED A BLASPHEMER OR A DOUBTING PERSON. This is something that many of us do not think about. However, in some religions you cannot even ask too many questions without your own faith being called into consideration. In some religions, if you ask too many questions it is thought to be challenging, which means that you doubt the religion. While in Hinduism you can ask all the questions you want because it is considered a part of one's spiritual process of understanding. 23. HINDUISM IS LIKE THE MILLION DOLLAR CULTURE. The reason why the Vedic philosophy is the million dollar culture is because just as when a millionaire automatically has all his ten dollar problems solved, so one who follows the Vedic philosophy has all his ten dollar questions answered. There are so many cultures and religions in the world, all of which may offer basic moralistic rules if not higher spiritual knowledge. But such paths often deal only with the ten dollar questions, and sometimes with difficulty. The Vedic system, however, goes much more deeply into dealing with more advanced levels of spiritual understanding. Thus, it is like the million dollar philosophy which, because of its depth of awareness and insight, already incorporates all these 10 dollar questions. In this way, it is not necessary to be distracted by 10 dollar religions or philosophies when you already have one worth a million dollars as we find in the Vedic knowledge. 24. THE VEDIC PROCESS OFFERS THE EASIEST PATH BACK TO GOD. Of course, this point may seem like it is merely a matter of opinion, but if we analyze things we can see that the Vedic system can be very easy and trouble free. It is merely a matter of love. That is the main thing. 25. HINDUISM ADVOCATES A UNIVERSAL RATHER THAN A SELF-CENTERED CONSCIOUSNESS. As explained earlier, the Vedic philosophy is a universal philosophy. It asserts that every individual is a part of the universe and in microcosm represents the macrocosm. A thorough study of Vedic astronomy will reveal that the universal form is also inside our body, and that the body represents the cosmos in miniature. In such a light, it can also be understood that man cannot be separate from family, society, country, or the universe itself. In other words, he or she is a multidimensional being who is connected in many ways to the multidimensional universe. A universal consciousness means that we perceive this connection, and how we are related to each and every being in some way. Therefore, our actions are connected to those around us, even to the plants and animals. Thus, it is recommended that we act as proper caretakers of all other living entities so that we do not do anything that will wrongly effect or create harm, even unknowingly, to others, which would only be reflected back on ourselves. Therefore, whatever we do will have a direct or no less than subtle effect on all and everything around us. This understanding also promotes the fact that we need to remember that we are all stewards and caretakers of the planet, the land, each other, and all creatures. 26. HINDUISM PROMOTES THE CAUSE OF REAL CARE AND CONCERN FOR OTHERS. By understanding our spiritual nature, and being able to perceive that nature in all other living beings, we naturally care for and are concerned about all others. This does not only mean the material benefits, such as making sure the hungry are fed, or the poor are clothed. But this also extends to the care for the soul. Naturally, it can be difficult to take care of the material or bodily needs of all other living beings. However, the point is that as long as we have these material bodies, there will be a constant drive to care for the problems that our material body will create for us. Therefore, by giving everyone the chance to advance spiritually can also help each person to solve this problem. Once a person has made enough spiritual advancement that they no longer need a material body and become free from any continued rounds of birth and death, then all such problems will naturally be solved. This is the true care and concern of the Vedic system. 27. WITH OR WITHOUT A CHURCH OR INSTITUTION, HINDUISM SHOWS AND ESTABLISHES THAT EVERYONE HAS A PERSONAL AND INDEPENDENT RELATIONSHIP WITH GOD, WHICH ONLY NEEDS TO BE REAWAKENED. This is an important point. There are other religions that teach that your only connection with God is through the church, or the institution, without which you are excommunicated or eternally damned. Unlike this, the Vedic system teaches that everyone is a spiritual being, and, thus, automatically a part of a loving God with an eternal relationship with Him. This relationship only has to be reawakened, which is the purpose of the many instructions given by God in the Vedic texts. It is also the purpose of the spiritual teachers who try to help everyone revive this eternal but dormant relationship. To rejuvenate such a relationship simply depends on one's sincerity to advance by following these instructions. It is not subject to an institution or a pope who alone claims to be in touch with God and knows the ultimate truth, upon whom we all are dependent, and who can dictate restrictions as he likes. In fact, any spiritual teacher is only as good to the degree in which he is at being a representation of God's love for us, or at being a transparent medium for the spiritual instructions of God and the previous acharyas or authorities. 28. IN ESSENCE, HINDUISM, THE VEDIC SYSTEM, OPENS THE DOOR TO THE REAL MEANINGS OF LIFE. After practicing and living by the principles of the Vedic philosophy, you can bring a perceptive and obvious change in your life, as well as into your own sphere of influence. By beginning to awaken your awareness of your spiritual identity and your relationship with the Supreme, you can easily feel a new level of happiness, peace, and contentment. You will have a clearer understanding of who you are, where you have come from, and your purpose in life. You will have a better focus on why we are here and what needs to done while living in this material world. Little things that you may have taken so seriously, that may have bothered you will no longer have the same affect on you. You will see with a clearer view of what really matters in life, and the superficialities that are not important. You will see that there is only one universal religion, and that is Sanatana-Dharma, awakening the natural proclivity and needs of the soul, and regaining our real spiritual identity and relationship with God. It is merely a matter of learning how to love and serve God. That is the heart of the Vedic path. This is a short description of the basics of Vedic culture and its philosophy. Many people do not know quite what it is, and it is often described incorrectly by many who are not a part of it. However, it is not as mysterious or complex as it is often portrayed to be. So here in the next few pages you can get a quick review and understanding of what it is. 1. The Vedic Tradition or Hinduism is more than a religion, but a way of life, a complete philosophy. 2. It is based on Universal Spiritual Truths which can be applied to anyone at anytime. 3. It is called Sanatana-Dharma, the eternal nature of the soul. 4. It recognizes that there is one Supreme Being with no beginning or end, the all in all, the unlimited Absolute Truth, which can expand into many forms. 5. That Supreme Being is found in the spiritual realm but also lives in the heart of all living beings. 6. The Vedic tradition recognizes that the individual soul is eternal, beyond the limitations of the body, and that one soul is no different than another. 7. The soul undergoes it’s own karma, the law of cause and effect, by which each person creates his own destiny based on his thought, words and deeds. The soul undergoes this karma in the rounds of reincarnation. 8. The soul incarnates through different forms (called samsara or reincarnation) until it reaches liberation (moksha) from the repetition of birth and death, and attains its natural position in the spiritual domain. 9. The Vedic path is based on regaining our natural spiritual identity. 10. It has a complete library of ancient texts, known as the Vedic literature, that explain these truths and the reasons for the tradition. 11. This Vedic literature is considered to be non-ordinary books that are the basis of the Vedic system. Some of these have been given or spoken by God, and others were composed by sages in their deepest super conscious state in which they were able to give revelations of Universal Truths while in meditation on the Supreme. 12. The Vedic path offers personal freedom for one to make his own choice of how he or she wants to pursue their spiritual approach, and what level of the Absolute Truth he or she wishes to understand. This is spiritual democracy and freedom from tyranny. 13. The Vedic path consists of ten general rules of moral conduct. There are five for inner purity, called the yamas--truthfulness, ahimsa or non-injury to others and treating all beings with respect, no cheating or stealing, celibacy, and no selfish accumulation of resources for one’s own purpose. The five rules of conduct for external purification are the niyamas--cleanliness, austerity, perseverance, study of the Vedas, and acceptance of the Supreme Being. 14. There are also ten qualities that are the basis of dharmic (righteous) life. These are dhriti (firmness or fortitude), kshama (forgiveness), dama (self-control), asteya (refraining from stealing or dishonesty), shauch (purity), indriya nigraha (control over the senses), dhih (intellect), vidya (knowledge), satyam (truth) and akrodhah (absence of anger). When it comes to Vedic culture, more popularly known as Hinduism, many people find it difficult or impossible to define it in a concise or adequate manner. It differs quite a bit from the conventional and western monotheistic religions with which many people are familiar. Hinduism is pluralistic. In other words, it does not claim any one prophet or savior; it includes all aspects of God; it does not subscribe to any one philosophy or dogma; it includes various schools of thought and ways of understanding spiritual Truth; it includes a variety of religious rites or sacraments; it does not exclude any particular scripture that can help a person understand more about God and spiritual Truth; and it does not say that you have only one life in which to become spiritually perfect or you will go to eternal damnation. Thus, Vedic philosophy is more of a way of living and an outlook on life than a religion. Because of this, Hinduism and the path of Vedic culture includes a variety of customs, ideas, and philosophies. It accommodates a wide range of approaches for allowing people to advance and understand our spiritual identity and transcendental Truth. It allows everyone to question the scriptures to increase one’s understanding, and recognizes no single person or prophet as having an exclusive claim over the Absolute Truth. Everyone can follow a system of realization to approach God since this is everyone’s right and destiny. This flexibility is one of the reasons why Vedic culture has continued over so many thousands of years. This is also why many variations of philosophical thought or schools of religion can be viewed as branches or tributaries of the same great river of sanatana-dharma, which is the universal spiritual knowledge and practice that is the essential teachings of the Vedic literature. Such spiritual knowledge can be recognized in many forms of religion or their scripture. 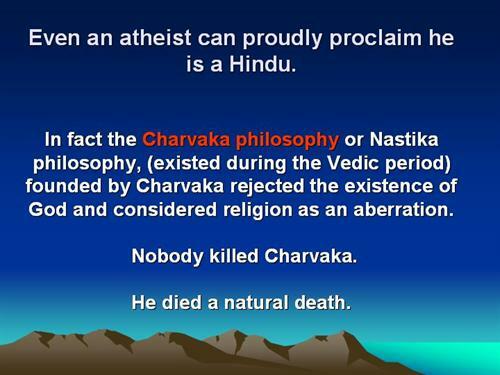 Because of this, it also means that no one is excluded or excommunicated from the Hindu or Vedic philosophy. There are no heretics, but there is room for everyone and respect for all who are practicing its basic principles of spiritual pursuit and understanding. This is also one reason why Hindus generally get along with other religions, though there have been many who have taken unfair advantage of their amiable nature. So Vedic culture is not an organized religion like Christianity or Islam. It has no single founder. It has no Pope. It has no hierarchy, though people do recognize particular spiritual authorities or gurus. It also has a lot of scriptures. And in some of these Vedic scriptures you are actually studying the history and culture of India, just as through the 66 books of the Holy Bible you are actually studying the culture and history of the Jews. Hinduism and Judaism are the sources of all modern religions in the world. Buddhism, Sikhism and to some extent Jainism and Zoroastrianism were outgrowths from Hinduism. Of course, Jainism existed during the period of the Rig Veda. Statues of Rishabha, the first Thirthankara and founder of Jainism was found in the Mohenjadaro and Harappa excavations. 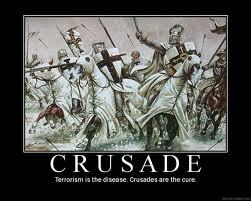 Islam and Christianity came from Judaism. Judaism, Islam and Christianity have Abraham as the common father figure. All three have many common prophets. C.S. Lewis, the great author and theologist accurately explained, “Finally it will come to two religions. Hinduism and Christianity. 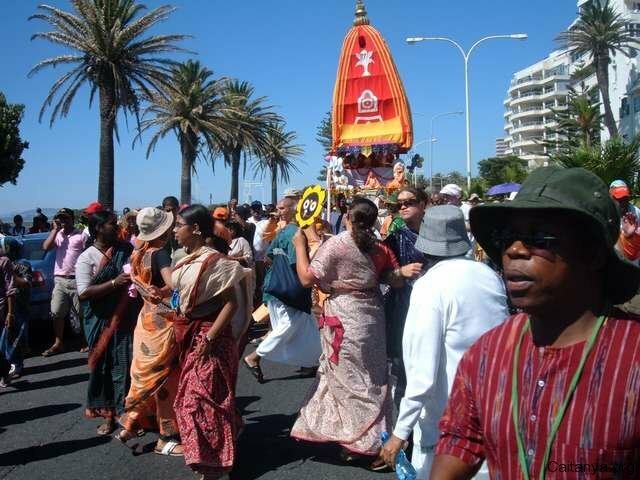 The first [Hinduism] will grow absorbing ideas and concepts from everywhere and later [Christianity] will keep away from everything that is foreign to it.” This is one reason why Hinduism has continued for thousands of years and cannot be destroyed, even if we burn every Vedic scripture and kill every Hindu theologian on earth. Hinduism or Vedic culture is a very dynamic, living, breathing Reality. The strength of Hinduism lies in its most amazing ability to adapt to different circumstances and different ages while maintaining its strong continuity with the past. It is for this reason, as stated above, that the Vedic culture is wonderfully catholic, elastic and even democratic. It provides the epitome of the individual’s right for self inquiry and spiritual pursuit. It is this reason that it also maintains a liberal amount of tolerance and unlimited freedom for one’s own method of private worship. It is, after all, up to the individual to carry on with one’s own spiritual progress. Everything else in the Vedic system is for his or her assistance. It is not meant for being a religious dogma or to stifle or control, though it does expect one to stay within the laws of the land and ride the high ground of morality and spiritual discipline. 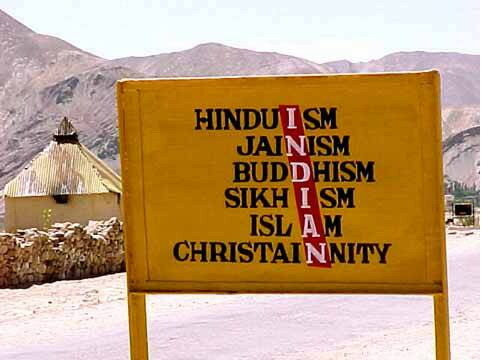 It is also because of this tolerance and mutual respect that you find Hinduism, Islam, Christianity, Buddhism, and even Zoroastrianism, Jainism, Sikhism, and the Parsis all accepting the shelter of life in India. India also allows all of the various sects of Islam to exist, whereas no other Islamic nation provides for such freedom within its own religion. It is merely the fanaticism that comes from the fundamental and monotheistic religions that have sparked the majority of violence that has been seen in India and throughout the world. It is also the ways of the various monotheistic religions and their conversion tactics that have encroached on the culture and land of the Hindus that have made Hindus view them with suspicion, and be less than welcoming in some areas of the country. It has made them to be more protective of their culture, taking up various means of defense that has been called communalism or saffronization by the so-called secular media. Yet, Hindus cannot be expected to humble themselves out of their own existence. Hindus make lousy terrorists, and they will not be such. But they also do not need to be the doormat of every other religion that wants another part of India. So, if left to themselves, Hindus and the followers of Vedic culture will continue to be one of the largest shelters for the greatest number of diverse religious groups there can be. It will continue to be a most tolerant, liberal, and respectful system of spiritual development, without the usual violence and persecution toward “non-believers” that seems to be the attendant of so many other less tolerant, monotheistic religions. It is this inherent acceptance of the right of the individual to proceed in the spiritual quest that is most suitable for him or her that separates the Vedic process from most other religions on the planet. There is both long term and short term goals. The Long-Term Goal: The ultimate goal of the Vedic process is moksha, or liberation and the release from samsara, or the continuous cycles of birth and death, otherwise called reincarnation. This liberation is the position of the soul when it regains or reawakens its spiritual consciousness to the fullest extent. When one’s consciousness is purified or completely spiritualized, and when the soul has regained its spiritual position and completely acts on that level, then there is no more need to take birth in a material body for the pursuit of material desires. One then enters back into the spiritual world, which is the natural home of the spirit soul, when the finite living entity returns to the Infinite. The Vedic concept of salvation is different from that of the Christians. Hindu salvation is known as Self Realization and rising above ignorance. In Vedic philosophy, salvation or liberation means that a person realizes that he is not the body, but the immortal soul (Atman) within. That is the reason why Hindu salvation is known as Self-Realization or realizing that one is the Immortal self and not the perishable body. This realization is the means of rising above the illusion that keeps us from being free. Real freedom on the Vedic path is freedom from material and sensual desires. Such desire is the basis of what keeps us bound up in earthly existence and in samsara. The Vedic system includes various processes in order to assist the living being to attain this freedom. According to the position and consciousness of the person, he or she may be interested in different processes, though some are more highly recommended in this present age. These may include the process of Jnana (knowledge), Vijnana (realized knowledge), Hatha-yoga (the practice of keeping the body in shape for ultimately pursuing the perception of spiritual consciousness), Yoga (the process for altering and uplifting the consciousness, which may include separate or individual practices), and Bhakti (the process of devotion in which attaining the Grace of God is the main focus). Each one of these systems or divisions deserves its own description to fully understand them, some of which will be summarized later in this introduction. So Hinduism/Vedic culture takes it for granted that there is more than one approach to understand different levels of spiritual Truth and attain salvation, and that these different approaches are not only compatible with each other, but are also complimentary. Thus, the disagreements that you find in most conventional and monotheistic religions, and the friction between the various sects that often develop, are not so much a part of the Vedic culture, even though individual preferences may exist. This is also why, generally speaking, many Hindus will respect all religions. They may be initiated by a Vedic guru, devoutly practice yoga, attend the temple regularly, yet still go to see some Christian preacher, or Buddhist teacher, or even hear an Islamic Imam talk about God. They may do this with the idea of attaining new insights, yet still not consider themselves falling away from their own path or converting to a different religion. 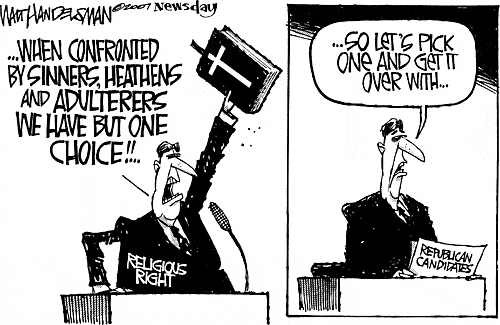 Yet, if a Christian or Muslim would do such a thing as participate in an alternative religion, or even a separate sect, they may be considered sinful and apostates, or at least hypocrites deserving of some punishment. But such narrow-mindedness hardly touches the person following the Vedic path. The Short-Term Goal is to find happiness. By understanding our spiritual identity, we also become free from the day to day turmoil and hassles that many people take so seriously. Some people let such problems control their lives. Life is too short for that. Allowing such circumstantial difficulties to increase our stress and anxiety only decreases our duration of life. Life is meant for being happy. But real happiness, which exists on the spiritual platform, is always steady and, in fact, is continually increasing according to one’s spiritual advancement. Such persons who understand their spiritual identity and are self-satisfied and content within themselves find happiness everywhere. This is what the Vedic process tries to give everyone. The Chandogya Upanishad (starting at 7.25.2) explains that he who perceives and understands this, loves the self, revels, rejoices, and delights in the self. Such a person is lord and master of the worlds because he has already attained all that he needs. He knows that he may be in this material world but is not of it. 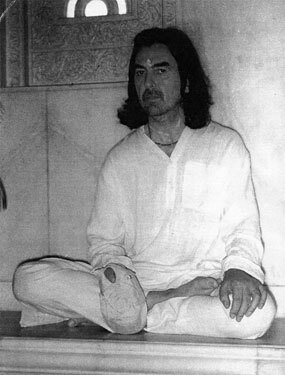 He is actually of the spiritual world and has regained his connection with it. Therefore, he looks at this world as if he were simply a tourist. He sees all the busy activities of people and society, the confusion, but he walks through it all unaffected. But those who think differently live in perishable worlds and have other mortal beings as their rulers. They are limited and controlled by their own material designations. But he who sees the soul of everyone, the spiritual identity beyond the body, does not see death, nor illness, nor pain; he who sees this sees everything and obtains everything everywhere. This certainly is the quality of those who have attained their own internal, self-sufficient happiness. A similar verse is found in the Katha Upanishad (2.5.12-13) where it says that those who have realized their self and also see the Supreme Being residing within their heart and in all beings as the Superself, to them belongs eternal happiness and eternal peace, but not to others. This happiness, therefore, is the goal of all people, and is the highest level of happiness which is attained when one understands his or her true spiritual identity and becomes spiritually Self-realized. It is generally accepted that it was the Persians who invaded India during the 6th century B.C. who gave the name “Hindu” for a society of people who lived in a certain region of India near the Sindhu river, later known as the Indus river. In Persian, the letter H and S are pronounced almost the same so they mistook the S in the word Sindhu as H and then started calling the people Hindus and their religion as Hinduism. Thus, the name is actually a misnomer since there are many schools of thought and views of God within the umbrella term of Hinduism, each with its own specific name. Dr. Radhakrishnan has also observed about the name Hindu: “The Hindu civilization is so called since its original founders or earliest followers occupied the territory drained by the Sindhu (the Indus) river system corresponding to the North West Frontier Province and the Punjab. This is recorded in the Rig Veda, the oldest of the Vedas, the Hindu scripture which gives their name to this period of Indian history. The people on the Indian side of the Sindhu were called Hindu by the Persian and the later western invaders.” This indicates that the name is not based on religion or theocracy, but is merely a name based on the particular locality of a people. This could also mean that numerous people, even tribals of India, Dravidians, or even the Vedic Aryans are all Hindus. Again, in this way, Hinduism can accommodate different communities, rites, various gods and practices. Other originations of the word Hindu may be given, but they all essentially show that it was a name indicating a locality of a society, and it had nothing to do with the religion, philosophy, or way of life of the people. This is why some followers of Sanatana-dharma or Vedic culture do not care to use the name Hindu, including gurus, to describe their spiritual path, even though it is based on the Vedic system. The more correct term for the Vedic process is the Sanskrit word Sanatana-dharma. This is a path and a realization. Sanatana-dharma means the eternal nature of the living being. Just as the dharma of sugar is sweetness, and the dharma of fire is to burn and give warmth, the spiritual being also has a dharma. That dharma is to serve and love, and that love ultimately is meant to be the relationship between the living being and God and all other living entities. When that love and spiritual realization is attained, then the living being regains his natural Divinity. To attain this stage, one can follow the path of dharma. Thus, dharma is also a code of conduct. This, however, is not a dogma or forced standard, but it is a natural training that brings people to a higher level of consideration and consciousness. Thus, the whole of society can develop in this refined manner to a higher level of awareness and understanding of our connection with each other, with nature, and with God. The Manu-samhita recommends the following characteristics to be developed. These include fortitude, forgiveness, self control, non-envy, purity, sense control, the ability to discriminate between good and evil, learning, truthfulness, and absence of anger. So we can imagine how much nicer the world could be if everyone developed these qualities. So Sanatana-dharma is also the path to attain our natural spiritual qualities. Dharma also means the natural laws that sustain and hold together the whole universe. So dharma is also that which brings harmony and unity, because that is how the universe, along with society in general, is maintained and preserved. In this way, Sanatana-dharma is also the path that allows the individual to realize his or her spiritual position and true identity, and also brings the ultimate stage of harmony and balance to each person, to society, and to the whole planet. This is the Vedic process. It is thus a Universal Truth in that it can be applied anywhere in the universe and at any time in history, to any people or culture, and it will produce the same results for all. This brings us to our next point. Since Sanatana-dharma is a universal process and applicable to everyone, then naturally anyone can practice the principles of it. Anyone can and should be allowed to participate in the process. Furthermore, anyone who is looking for the ultimate spiritual Truth is already one who is following the path of Sanatana-dharma. So you could say that anyone who is sincerely looking for such Truth with an open mind is already on the spiritual path, at least on some level, and is thus also a Hindu or Sanatana-dharmist, a follower of Sanatana-dharma. The point is that there is one and only one God and one Absolute Truth. The very first of the Vedic books named the Rig-Veda proclaims, Ekam Sat, Viprah Bahudha Vadanti (There is only one truth, only men describe it in different ways). So a Jew or a Christian or a Moslem who is in search of the Absolute Truth is automatically on the path of Sanatana-dharma. However, if they get stuck with accepting nothing more than their own local traditions, this may hamper their growth in understanding a broader range of the many aspects of the Supreme that are described in other scriptures, such as those of the Vedic literature. So a person’s progress depends on how far he or she really wants to go in this lifetime, and how they approach various levels of knowledge to understand the Absolute Truth. 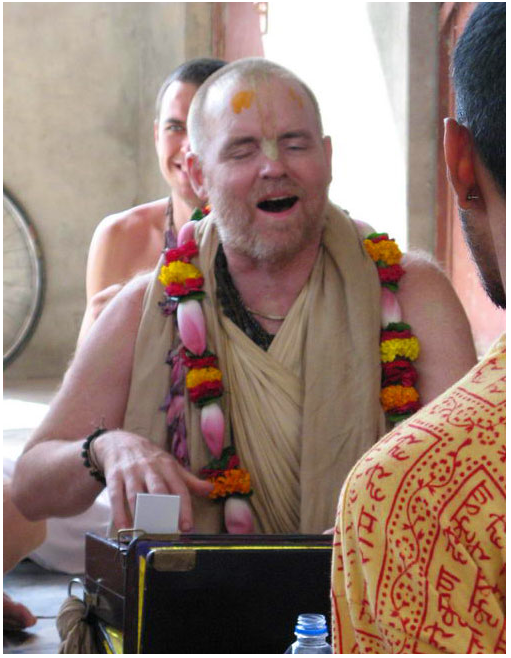 So those who may be accepted as followers of the Vedic tradition generally accept the following: A) The Vedic literature presents knowledge of the Absolute Truth and is the authority on the Vedic tradition; B) There are various ways to realize different aspects of this spiritual Truth; C) God can appear in different forms; D) We are given more than one life on this road of Self-Realization; E) That ultimately we are responsible for accepting the path we take and the progress we make. To clarify this last statement, even if you accept the path of Christianity and believe that Jesus will save you, Jesus also said that faith alone is not enough. You must show your faith by your works, and your works will show the true state of your desires and consciousness. Otherwise, if by faith alone you go to heaven yet remain full of material desires for earthly things, do you think Jesus would force you to stay in heaven? No, he would let you go back to earth, to where you heart is, to try and satisfy all those desires because that is your state of consciousness. So your spiritual advancement is still up to you. No one individual founded Vedic culture, nor is there any single prophet, holy book or way of worship. The Vedic culture has a library of texts to help establish the nature of the Absolute Truth. Hindus recognize the good and spiritual essence in all religions, so it is easy for them to display respect and tolerance for other spiritual paths. Through the Puranic stories of the universal creation, we learn that the Vedic knowledge was first given by Lord Vishnu to the secondary creator and first living being known as Brahma. It was Brahma who then disseminated it to other great sages and masters, the Rishis. It is through the continued research and output of these learned Rishis that humanity has learned the various levels of spiritual Truth, as they have been handed down through the generations. To explain further from the previous point, nobody knows when the Vedic culture started. It goes back to before the beginning of history. If you go by the Vedic legends and histories, Vedic culture is trillions of years old. It is said to have originally been a vibration, an eternal and pure spiritual vibration known as shabda-brahma. This existed eternally before the material creation ever manifested. This spiritual vibration was first articulated to humanity by God. It is said that through this spiritual vibration one can understand the Supreme. This vibration descended from the spiritual domain and pervades the material strata. Thus, those great sages who have become spiritually realized can receive and perceive this spiritual vibration. Then they work to reveal that to others through their writings and descriptions of the path by which one can be spiritually enlightened themselves. This was the start of the Vedic philosophy and its system of knowledge. According to Vedic scriptures, this revelation of the spiritual vibration started as shruti - that which is heard. It was passed on as a vocal tradition. The great seers of ancient times called Rishis who had perfected themselves have heard in their hearts the eternal truths and taught those truths to disciples by telepathy and talks, and later through writings in books which became known as the Vedas and Upanishads. These are known as the shruti literature The remaining part of the Vedic literature is called smriti, or that which is remembered. All these Vedic scriptures were considered as revealed truths from God. Even if you accept the conclusions of Max Muller, the German philosopher, Vedic culture and its knowledge is at least 8000 to 9000 years old. However, studying the relics of Mohenjadaro and Harappa excavations, the Indus Valley civilization shows the seeds from which arose many other cultures and concepts. The Indus Valley was home to the largest of the four ancient urban civilizations of Egypt, Mesopotamia, India and China. Harappa and Mohenjodaro were cities in the Indus Valley civilization that flourished around 2,500 B.C. in the western part of South Asia. The roots of Vedic culture can be traced to this civilization and even earlier. That is why you can see Vedic culture in the relics of all other civilizations like Egyptian, Celtic, Mayan, Greek, Roman, etc., which I have analyzed more completely in another book. Hindus, along with most every other religion, believe in life after death. According to the Vedic philosophy, the body alone dies, the soul within is eternal and thus never dies. The process of reincarnation means that the soul takes another birth in a material body to continue with material experiences or the pursuit of material desires. Thoughts and desires create a level of consciousness for the individual. This consciousness at the time of death is what determines a person’s next life. Then, after death, a person is drawn toward a new body and set of circumstances that is most suitable for that person’s level of desires and thinking. There has also been an increasing number of books written by professionals that document the stories of those who have remembered their past lives, especially children who have no ulterior reason to mention their memories about previous lives. Yet, the evidence these researchers have provided has shown that reincarnation and living multiple lifetimes is a fact and has been going on indefinitely. The path the soul takes into another birth is decided upon by past actions, which is known as karma. So the actions of our former body does not die with the body. 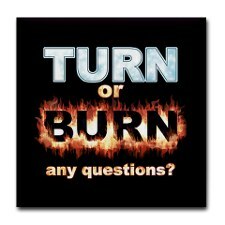 Past actions and the karma from them are attached to the subtle body and carry over from one physical life to the next. This is what determines the kind of body the soul takes in the next life and what situations of happiness or suffering will affect it. When an individual soul exhausts all its material desires and karmas, it is free to enter into the spiritual domain, in which case Hindus say that the soul has attained moksha or liberation. How many lifetimes we spend in this universe is up to us. The Vedic literature, especially the Bhagavad-gita, very clearly says that one can attain liberation in one life, provided one surrenders his will to the will of God 100%. This is done by understanding and following the Lord’s instructions. This sort of surrender allows one to spiritualize his or her consciousness, in which case all material desires become eliminated. And without any material desires to fulfill, there is no further need to take birth in another material body. The point is, you cannot fulfill material desires without a material body. But when one purifies himself through spiritual practice, one can become free from such desires and become eligible for liberation into the spiritual domain. Lord Krishna says: “Those who surrender all actions to Me and regard Me as the supreme goal and worship Me with whole hearted devotion, I will deliver them from repeated births and deaths.” In another verse, Lord Krishna says: “Abandon all varieties of religion and just surrender unto Me. I shall deliver you from all sinful reaction. Do not fear.” (Bg.18.66) Thus, our eagerness to surrender to God will certainly diminish the need for further rounds of birth and death in a material body in this cosmic manifestation. In fact, we can become liberated in this one life if we are serious and sincere. According to Vedic knowledge, it is not necessarily so that a human will always reincarnate as a human being. If a man exhibits beastly character throughout his life, the low consciousness that he develops will see to it that he reincarnates as a beast. A glutton may take birth as a pig or another lower form of life. The Vedas talk about 8.4 million species of life, right from an amoeba up to human beings and demigods. A person can take any of these life-forms. Sometimes the soul will also remain in a standstill state for long periods of time without taking any body at all. However, the soul can work out its karma through spiritual practice, called sadhana, only if it takes a body. So for attaining liberation, or salvation, the soul is bound to reincarnate. Lord Krishna has explained in the Bhagavad-gita that whatever one thinks of during the time of death, one will attain that in the next life. So the whole process of religion or spiritual practice is to raise one’s consciousness and spiritually purify it so that we can enter the spiritual dimension after death. But a man who has beastly ideas and desires throughout his life is unlikely to think of God at the time of death. He will likely take his beastly thoughts and desires into the next life, which will propel him to his next form of existence. Only God-fearing people can think of God at the time of death; others will think of a multitude of things but not about God. And that is what propels one towards the next appropriate body which will accommodate that consciousness. The understanding of reincarnation is not complete without understanding the law of karma. So followers of Sanatana-dharma also accept the Biblical concept “Whatever a man soweth, that shall he reap”. The doctrine of karma has been elaborated since the days of the Rig-Veda and it is very well explained in the Brihadaranyaka Upanishad. Every action and every thought has a reaction. That is the basis of karmic law. This is also the second law of thermodynamics: that every action has an opposite and equal reaction. On the universal level this is the law of karma. Applying the law of karma to individual development means that every thought and every action produces a reaction of some kind that will manifest in our lives. It is weighed on the scale of eternal justice. The law of karma is one of cause and effect. Nobody can escape from any karmic debt since it follows you throughout the universe. So if you act piously and righteously, such action produces good or heavenly reactions. 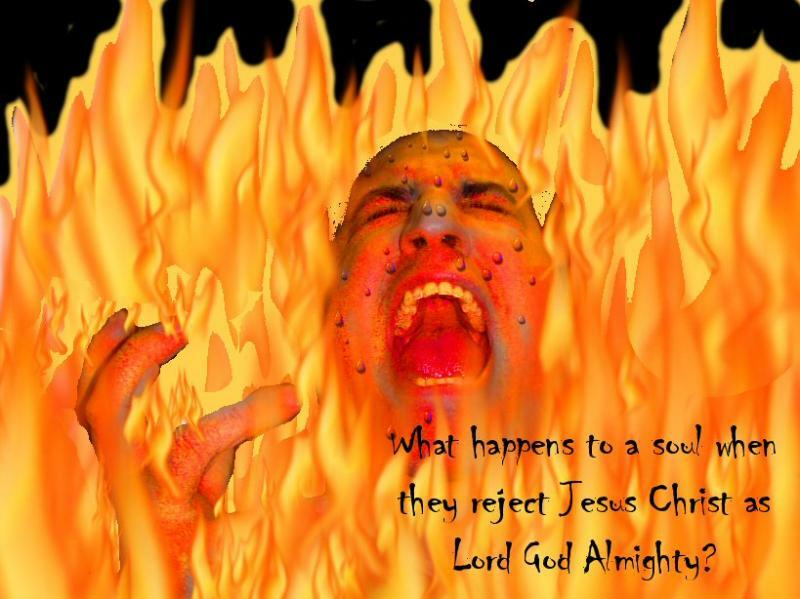 If you act cruelly, such acts produce bad or even hellish reactions, or reversals in life. So whatever we do in this life is felt in the form of good or bad reactions later in this or the next life. In the same way, our present life is based on a combination of the good or bad reactions from what we have done in previous lives. So the idea is to become free from such reactions, no matter whether they be good or bad so we can become free from taking any more births in this world. Then, with a spiritualized consciousness, we can reach the spiritual domain. According to Vedic knowledge, the body alone dies, the soul never dies. But past actions are attached to the soul and they decide the path of the soul’s travel. So if you are born rich or poor, it is because of your actions in a previous life. If you are born with disease, that also is the result of your past actions done in previous lives. After death, the soul carries a heavy load of karma and seeks an ideal body to be born in again. If you had lived as an evil individual in your last life, then the soul will take birth in a home where people may be leading evil lives. You will be forced to endure the consequences of your nefarious activities. However, if you had lived a pious life, then you will be reborn in an ideal home where both parents will be pious and happy. On the other hand, if you are born in a good and rich family because of your pious acts from a previous life, yet all you do is engage in selfish or cruel activities in this life, then you will simply use up all your good karma and pave the way to a lower birth in your next life. According to Vedic understanding, the soul continues this journey with its load of karma from one life to another until it exhausts all karma by either undergoing the appropriate amount of pain or pleasure in the body, or by becoming purified through spiritual practice. The different methods of sadhana or God-realization provide easy ways to put an end to this drama of the continuous ups and downs in the body that you are given according to one’s karma. One point to consider is that God will never punish us. He does not have to. God has created man near to perfection and has given him the “Free will” to decide what he or she wants to do. God never interferes in our decisions. There is no such thing as being cursed by God. Yet, He is always trying to call us home to the spiritual worlds. It is we ourselves who make our lives miserable or happy. 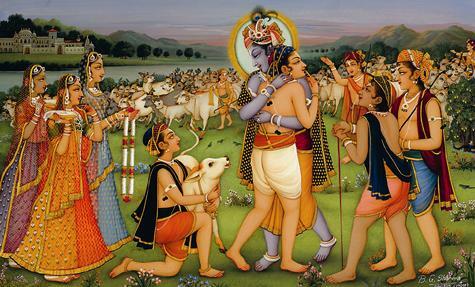 Even in the Bhagavad-gita, Lord Krishna never tried to influence Arjuna’s free will. 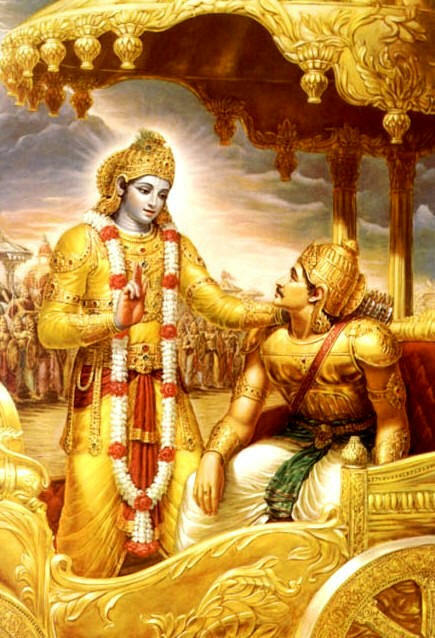 Lord Krishna, like an adviser, only discussed with Arjuna (his disciple) the various options he could take in his life and then let him make his own decision. So the condition of our lives and even of the planet is merely a reflection of the consciousness of the people who inhabit it. And it is simply one’s ignorance to say that something is the “Revenge of God”, etc. Hinduism is open, with open doors and open windows, meaning no closed minds. So it does not promote a supremacy of any particular point of view as the only way. It has respect for all ways to God, and different ways are provided within the Vedic context for different people, depending on what they need. This is a rare point to find in religion. The Vedic process allows for the utmost freedom of thoughts and actions in the system for understanding the Absolute Truth. Sanatana-dharma never forbids anyone to question its fundamentals. In other words, anyone can ask any question they want without feeling that it is overstepping or questioning the authority of the Vedic teachings. Whereas if you ask too many questions in other religions, you can be criticized or ostracized from the religion. That’s what attracts many to Hinduism. In Vedic culture, you may come across people engaged in simple acts of worship on one side, and on the other you will come across concepts parallel to Quantum Physics and Neil’s Bohr Theory of nuclear structure and reactions. On one side there is the Advaita or nondual philosophy, and still on another side there is the Dvaita or dualist philosophy. Hinduism never banished anyone for inquiring into some aspect of God, or for accepting a particular Vedic text or scripture, or for not observing a particular ritual. Mahatma Gandhi said that even atheists can call themselves Hindus. Voltaire in an Essay on Tolerance wrote: “I may disagree with what you say, but I will defend to the death, your right to say it.” In the same way, Hinduism maintains this principle of individuality and freedom for investigating the way to reaching the Absolute Truth. The Vedic system not only allows but actually encourages one to seek truths from all sources. Hinduism has no problem facing any type of questions. In fact, most of the Vedic texts are structured around questions and answers of all kinds. It has answers for everything and covers a multitude of topics, as an analysis of the Vedic texts will reveal. It does not have to hide behind what may appear to be unquestionable spiritual dogmas. It absorbs new ideas like the use of technology and modern science, psychology, and so on. Within Hinduism, you can think and argue on any subject. We are only going to give a short summary of the Vedic texts here. We have already written a more complete analysis elsewhere and want to keep this introduction short. So, to begin with, the Vedic texts are written in Sanskrit. Sanskrit, which literally means “cultured or refined”, is the classical language of India and is the oldest and the most systematic language in the world. Forbes Magazine, (July, 1987) wrote: “Sanskrit is the mother of all the European languages and is the most suitable language for the computer software.” It is older than Hebrew or Latin. According to the PBS video “The Story of English” the first words in the English language came from Sanskrit. The word “mother” came from the Sanskrit word “mata” and “father” came from Sanskrit word “pita”. Believe it or not the word “geometry” came from a Sanskrit word called “Gyaamiti” meaning “measuring the earth”. The word “trigonometry” came from the Sanskrit word “trikonamiti”, which means “measuring triangular forms”. Numerous other similarities and connections can be found between Sanskrit and many other languages. The very first of the sacred books of Vedic culture, in fact the oldest books on earth, are called the Vedas. The word Veda means knowledge. The word Veda came from the root word vid meaning “to know”. The Vedas are the very first scriptures of Hinduism. Vedas, as described by the scriptures, were given by God. There are four Vedic samhitas, which are the Rig-Veda, Sama-Veda, Atharva-Veda, and Yajur-Veda. The Sanskrit word samhita means “put together”. They contain wisdom that has been assembled to teach men the highest aspects of truths which can lead them to higher levels of existence, as well as to God. The Vedas also discuss rituals and ceremonies to attain self-realization as well as wisdom dealing with many other aspects of life. These four samhitas primarily contain the basic texts of hymns, formulas and chants to the various Vedic deities. To briefly described them, the Rig-Veda -- Veda of Praise -- contains 10,522 verses in 1,017 hymns in ten books called mandalas. The Rig-Veda is the oldest book in the world. The Rig-Veda was around for many years before it was finally compiled in written form. According to Bal Gangadhar Tilak and the Vedic tradition, it was written around 5000 BC. The Rig-Veda is older than Gilgamesh (2500 B.C.) and the Old Testament. In the Rig-Veda there are 100 hymns addressed to Soma; 250 addressed to Indra; 200 hymns addressed to Agni; and many addressed to Surya. Few others are addressed to the Ushas, Aditi, Saraswati, Varuna, and the Asvins. Lord Vishnu is not addressed so often therein because the Vedas focused more on appeasing the demigods for blessings to attain material facility rather than liberation. The Yajur-Veda, which is essentially the Veda of liturgy, contains some 3988 verses dealing with rules and regulations for conducting rituals and also offers various levels of wisdom and advice. It is based on the Rig-Veda and consists of prose as well as verse. This Veda is indeed a priestly handbook, even describing the details of how to make an alter. The Sama-Veda, the Veda of chants, offers knowledge of music in 1549 verses. Sama means “melody”. The classical Indian music originated from this Veda. This Veda is also connected with the Rig-Veda. To some extent much of this Veda is a repetition of the Rig-Veda sung in melodious format. Invocations of this Veda are primarily addressed to Soma (the Moon-god as well as the Soma drink); Agni (the fire god); and Indra (god of heaven). The Chandogya Upanishad came out of this Veda. The Atharva-Veda is said to be the knowledge given by the Sage Atharvana. It has around 6000 verses. Some state that sage Atharvana did not formulate this Veda but was merely the chief priest in the ceremonies associated with it. Atharvana who is mentioned in the Rig-Veda was considered as the eldest son of Lord Brahma (God of creation). The Atharva-Veda is also known as Brahma-Veda because it is still used as a manual by Hindu priests and Brahmins. Ayurveda is a part of Atharva-Veda. A large number of Upanishads also came from the Atharva-Veda. Brahmanas are other Vedic books that provide descriptions as well as directions for the performance of rituals. The word originated from the Brahmana priests who conduct the Vedic rituals. Aryanakas are additional books that contain mantras and interpretations of the Vedic rituals. These books also known as “forest books” since they were used by saints who had retired to meditate in the forests. The Upanishads are texts by different saints that reveal ultimate truths. Many of them are connected with certain Vedas. The Upanishads basically explain the non-material aspect of the Absolute Truth and the oneness of Brahman. In this way, they do not really show that much about the personal nature of the Supreme Being. Thus, a person will not have much insight into the Supreme Being’s personal form by studying only the Upanishads. However, some of them do go into introducing the fact that there is more to understand about God beyond the Brahman. The Upanishads also help explain the spiritual dimension of our real identity and our qualities which are the same as the Brahman, but are different in quantity. We are the infinitesimal whereas the Brahman and Bhagavan are the Infinite. Yet, if one does not complete the study of the Vedic literature, a misinterpretation of the Upanishads may lead one to think that this oneness of spiritual quality between ourselves or the jiva souls and the Brahman means that we are the same as Brahman, or that we are the same as God. But that is not accurate. There are a total of 108 major Upanishads, and many more minor ones. The are 13 principle Upanishads which are named after the sages. These are: 1. Isa Upanishad, 2. Kena Upanishad, 3. Katha Upanishad, 4. Prasna Upanishad, 5. Mundaka Upanishad, 6. Mandukya Upanishad, 7. Aitareya Upanishad, 8. Taittiriya Upanishad, 9. Chandogya Upanishad, 10. Brihadaranyaka Upanishad, 11. Kaushitaki Upanishad, 12. Shvetashvatara Upanishad, and 13. Maitri Upanishad. The Vedanta Sutras are another important book that also goes on to explain spiritual truths to the aspirant. But these are presented in codes, or sutras, that were meant to be explained by the spiritual master. So any edition of the Vedanta Sutras will mostly have large purports that help explain the meaning of the sutras. The basis of these explanations will depend on which school of thought in which the teacher has been trained. Thus, some will be more devotionally oriented, while others may be more inclined toward meditation on the impersonal Brahman. 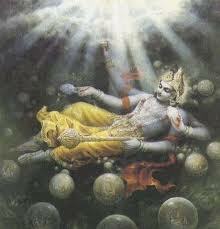 Vedanta essentially means the “End of the Vedas”, or the end of all knowledge. The Itihasas are the Vedic histories of the universe, known as the Puranas, which are a large and major portion of Vedic literature. The Itihasas also include the Vedic Epics, such as the Ramayana and the Mahabharata. was written in very stylish Sanskrit language. This beautiful poem consists of 24,000 couplets. The Ramayana is a story which projects the Vedic ideals of life. There are many versions of the Ramayana. The Hindi version was written by sage Tulsi Das. The Malayalam version (Kerala state) was written by Thuncheth Ezuthachan. The story in brief is as follows: Jealousy of his step-mother exiled Rama into the jungles along with his wife Sita and brother Lakshmana. There poor Sita was kidnapped by Ravana, the demon-king of Sri Lanka. Rama went to rescue her with the aid of the monkey-king Sugriva. In a great battle, Rama annihilated Ravana and his army. Thereafter, Rama along with Sita and Lakshmana returned triumphantly to their kingdom. Rama is an example of the perfect husband, Sita is the perfect wife, and Lakshmana is the perfect brother. The Ramayana is a very cherished poem of the Hindus. The holy Deepavali festival is a celebration of victory of Rama over Ravana. Diwali or Deepavali is the “festival of lights” and is celebrated throughout India. The Mahabharata is another of the world’s great epics which consists of episodes, stories, dialogues, discourses and sermons. It contains 110,000 couplets or 220,000 lines in 18 Parvas or sections. It is the longest poem in the world. It is longer than Homer’s Odyssey. It is the story of the Pandvas and Kauravas. 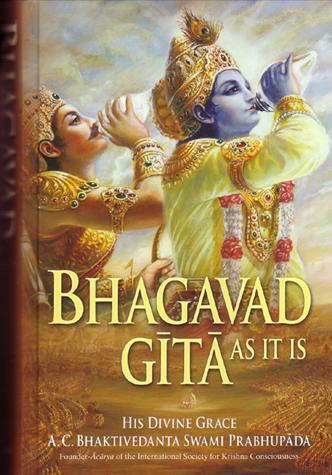 The Bhagavad-gita is a chapter of the Mahabharata. Apart from the 18 Parvas there is a section of poems in the form of an appendix with 16,375 verses which is known as Harivamsa Parva. So in total there are 19 Parvas, even though many saints do not consider the last Parva as important. The Bhagavad-gita, which means the song of Bhagavan, or God, is a part of the Mahabharata, appearing in the middle of it. Many consider the Bhagavad-gita as the most important of the Vedic scriptures and the essence of the Upanishads and Vedic knowledge. Anyone interested in the most important of the Eastern philosophy should read the Bhagavad-gita. If all the Upanishads can be considered as cows, then the Bhagavad-gita can be considered as milk. The Bhagavad-gita consists of 18 chapters and over 700 verses. It deals with all types of yogas, the means of self-realization. It is in the form of a very lively conversation between the warrior-prince Arjuna and his friend and charioteer Lord Krishna. This was spoken at the outset of the great Mahabharata war, in the middle of the battle field at Kuruksetra. This can still be visited just three hours north of New Delhi. Just before the beginning of the war, Arjuna refused to fight when he found he had to kill thousands of his own kinsmen to be victorious in the war. 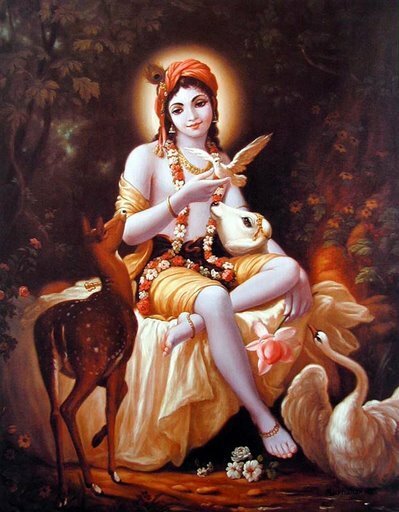 Lord Krishna advised him on a very large variety of subjects in a question and answer format. At the end, Arjuna took Lord Krishna’s advice and fought and won a very fierce war. The Gita has an answer to every problem a man may face in his life. It never commands anyone what to do. Instead it discusses pros and cons of every action and thought. Throughout the Gita you will not come across any line starting or ending with Thou Shalt Not. That is the reason why the Gita is the darling of millions of seekers of truth throughout the world. There are many versions of Bhagavad-gita. The very first English translation of the Gita was done by Charles Wilkins in 1785, with an introduction by Warren Hastings, the British Governor General of India. One of the most popular translations was done by Sir Edwin Arnold, under the title The Song Celestial. 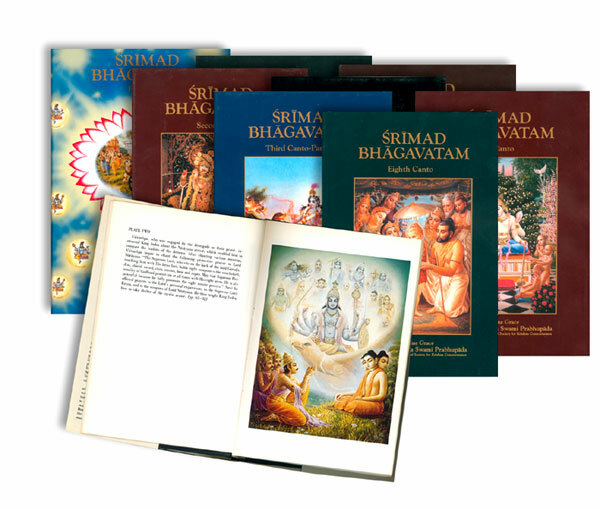 One of most descriptive and accurate translations of the Gita was done by His Grace A. C. Bhaktivedanta Swami Prabhupada of the International Society for Krishna Consciousness, called The Bhagavad-gita As It Is. Almost all saints in India have published their versions of the Bhagavad-gita, some of which arrive at various conclusions or viewpoints. So one does need to display some caution in picking which edition to read. Most intellectuals in the world go through the Gita at least once in their life time. 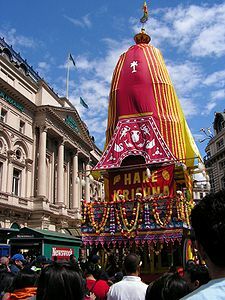 Aldous Huxley wrote in his introduction of The Song of God by Swami Prabhavananda and Christopher Isherwood: “The Bhagavad-gita is perhaps the most systematic scriptural statement of the perennial philosophy”. The Gita won the interest and admiration of great intellectuals such as Von Humboldt of Germany and Emerson of America. It has also influenced many Western thinkers, such as Hagel and Schopenhauer. Robert Oppenheimer, the very first Chairman of Atomic Energy Commission and father of Atom bomb was a great admirer of the Bhagavad-gita. He learnt Sanskrit during the Manhattan Project to understand the true meaning of the Gita. He really shocked the world, when he quoted a couplet from the Gita (Chapter 11:12) after witnessing the first Atomic Explosion in the state of New Mexico, which reads, “If hundreds of thousands of suns rose up into the sky, they might resemble the effulgence of the Supreme Person in the universal form.” Later when he addressed congress regarding the Atom Bomb he said the Atom Bomb reminded him of Lord Krishna who said in the Bhagavad-gita, “Time I am, the devourer of all”. The Puranas are the Vedic religious histories of the universe which expound various levels of the Vedic truths. They are divided into three sections. 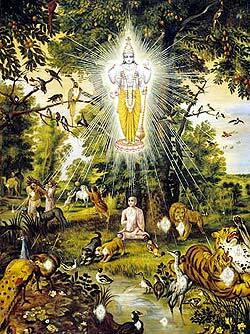 The six Puranas that address Lord Vishnu are: 1. Vishnu Purana, 2. Narada Purana, 3. Srimad Bhagavata Purana, 4. Garuda Purana, 5. Padma Purana, and 6. Varaha Purana. The six Puranas that address Lord Siva are: 1. Matsya Purana, 2. 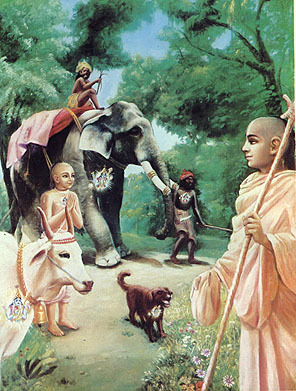 Kurma Purana, 3. Linga Purana, 4. Vayu Purana, 5. Skanda Purana, and 6. Agni Purana. The six Puranas that primarily address Lord Brahma are: 1. Brahma Purana, 2. Brahmanda Purana, 3. Brahma-Vaivasvata Purana, or the Brahma-Vaivarta Purana, 4. 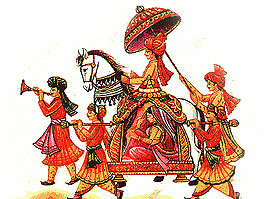 Markandeya Purana, 5. Bhavishya Purana, and 6. Vamana Purana. Besides these, there are an additional 18 to 22 minor Puranas. The 20 major Puranas include all the above as well as the Shiva Purana and the Harivamsa Purana. Of all Puranas, the Srimad Bhagavata Purana addressed to Lord Vishnu, and which discusses the detailed pastimes of Lord Krishna, is considered the most important. It contains 15,000 stanzas in 12 cantos. It was written by Sage Badarayana, also known as VedaVyasa or Vyasadeva. Vyasadeva, after writing all of His previous Vedic books, said the Bhagavatam was His own commentary and conclusion of all Vedic thought. 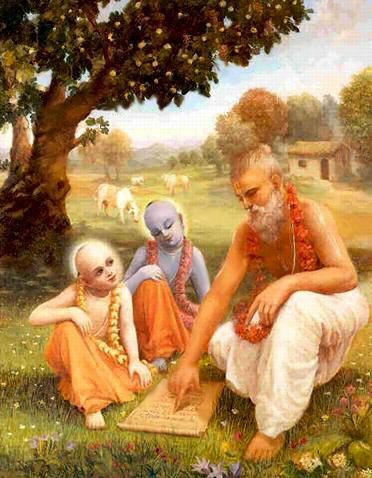 The greatest exponent of the Srimad-Bhagavatam is Sage Suka, the son of Sage VedaVyasa. This book was recited to King Pariksit by Sage Suka in one week before the death of the King by the bite of a serpent. Much of the book is in dialogue form between King Pariksit and Sage Suka. The Srimad-Bhagavata consists of stories of all the Avataras of Lord Vishnu. The 10th chapter of the book deals with the story of Lord Krishna in detail. The last chapter deals exclusively with the Kali-Yuga, the present age, and about the last Avatara of Lord Vishnu, Kalki. There is also a vivid description of the Pralaya or the great deluge in the last chapter. 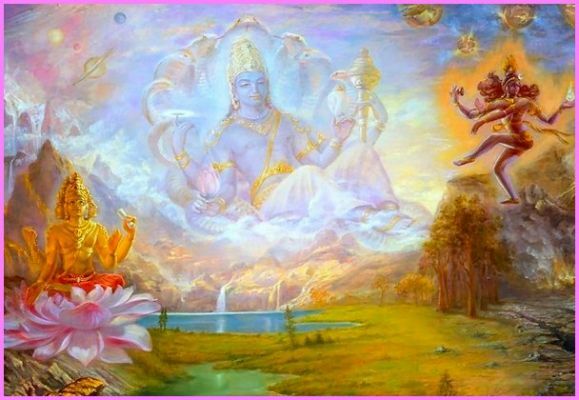 According to the Bhagavata Purana the universe and creation came into existence because God in a pastime (Lila) willed to do so, and to manifest His material inferior energy. According to this scripture, there are nine different ways of exhibiting Bhakti or devotion to God like listening to stories of God, meditating, serving and adoring his image and finally self-surrender. This book is an authority on Vaishnavism in Hinduism and is a primary text to all Viashnavas (worshipers of Lord Vishnu and His avataras) including those of the Hare Krishna Movement. Shakti Agamas - worship God as Mother Goddess. There is no Agamas for Lord Brahma (God of creation). Shaivites have 28 Agamas and 108 Upa Agamas (minor Agamas). Shaktas recognize 77 Agamas. There are many Vaishnava Agamas of which the Pancharatra is one of the most important. Each Agama consists of philosophy, mental discipline, rules for constructing temples and religious practices. The Tantras started during the Vedic age, which consist of cosmology, yogic exercises, etc. Tantra is very important and very vast. The Sanskrit word Tantra means to expand. Tantrism researched into Astronomy, Astrology, Palmistry, Cosmology, as well as the knowledge of the Chakras and Kundalini power, etc. The Upa Vedas are the considered the smaller Vedas. They provide various sorts of knowledge and Vedic sciences. These include: 1. Ayurveda - Hindu science of health and longevity; 2. Dharnur-Veda - Hindu science of archery and war; 3. 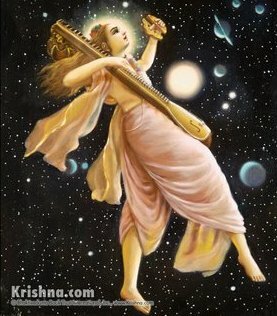 Gandharva-Veda - Hindu science of Music and Dance; 4. Artha Shastra - Hindu science of economics and government. 1. Dharma Sutras - Codes of Manu, Yatnyavalkya, etc. To explain a little further, Ayurveda is the Vedic scripture of medicine. It consisted of more than 100,000 verses initially. Still it is considered as an Upa Veda of the Atharva-Veda. Sometimes this medical system is called part of the Fifth Veda. The Sanskrit word Ayurveda means medicine. The remedies in Ayurveda are mostly herbs and natural substances. The gods of healing in Ayurveda are Prajapati, Brihaspati, Indra, etc. Ayurveda originally classified diseases into physical, supernatural and spiritual. Ayurveda is practised widely in the State of Kerala in India. It is taught in the Ayurveda College, Kottakkal, Kerala. The science of Jyotisha is meant as both astrology and astronomy. Both were part of the group known as the Vedangas. Astrology has come out of the Vedic sciences, and it does play a major part in the lives of people. It is still used widely for many purposes. The God of Astrology is Lord Subramaniyam, son of Lord Shiva. Some say that, once upon a time, astrology was a very well developed science, but today’s astrology is only a skeleton of what it once was, with most of the valuable knowledge lost due to the practice of utmost secrecy by the learned men in Hindu society. According to the Vedic understanding, there is only one God but there are three MAIN aspects of this Absolute Truth, namely Brahman, Paramatma and Bhagavan. Brahman is the formless but all-pervasive force and energy of God. It is the impersonal, non-dual aspect, or great white light of the Brahman effulgence. It is composed of innumerable souls which have merged into it, and is also the great rays or brilliance that emanate from the body of the Supreme Personality. Paramatma is the form of the Lord as the Supersoul, the localized aspect of God. He is the Lord in the heart of every living being, and also the center of every molecule. It is He that witnesses all that we do, and even guides us when we surrender to His will. It is He that gives the ability in man, and motivates us as a conscience or guiding voice in our spiritual quest. Then there is the Bhagavan aspect of God, which is God as the Supreme Being or Personality. After studying all the major Vedic texts, as also established by Lord Brahma who did this, they ultimately point to Lord Krishna and His expansion of Lord Vishnu as the main forms of the Supreme Being. It is these forms from which expand all other forms, avataras, or incarnations of God which appear for particular pastimes or purposes, all to show the various glories of God. It is Krishna that is His personal form which we can interact with and with whom we can develop a truly loving relationship. Everyone knows that the highest happiness that we can find is that which exists in a loving relationship with someone. God is also the Supreme Lover, in whom we can find the highest happiness in a spiritual relationship. The spiritual world is meant for those who have purely desired a deep spiritual and loving relationship with God. For those who want something else, other realms are there so they can find such things, such as this material realm. Thus, the spiritual worlds are protected from any disturbances from the living beings who are not yet qualified for attaining the privilege of having a personal loving relationship in the spiritual domain. The point is that to understand God completely, a person should understand all three aspects of God, namely Brahman, Paramatma, and Bhagavan. It is not enough to comprehend only one aspect of God and think that God does not have the other facets, or to view God as only personal or impersonal. Sometimes a person who thinks that God ultimately has no form will disregard the Bhagavan aspect, or even think that it is elementary and for simple minded people. Such impersonalists may think that the personal form of God is a product of maya, the illusory energy, as if God cannot descend into the material world in His personal form. However, Lord Krishna clearly explains throughout the Bhagavad-gita that He is the controller of the illusory energy and that He is the Supreme Being who appears in His own personal form and of His own accord. Nonetheless, mayavadis are those who are convinced that the highest reality is but the formless Brahman and all other forms of God are merely temporary manifestations that are dependent on the material energy. But that is not correct. There are also those who understand only the Bhagavan or personal form of God and who will think that impersonalists, or those focusing on the Brahman aspect, have no understanding of God at all. But actually it is said that until we understand all three of these basic features of God, our understanding of Him will never be complete. So we need to see how all three aspects of God are connected, and that by studying all three of these characteristics will provide us with a complete understanding of all the potentials of the Supreme Being. With other incarnations of Lord Vishnu, according to the Bhagavata Purana, the main avatars number twenty-two. They consist of the ten incarnations already described and 12 more as follows: 1. Sanat Kumara and his three brothers; 2. Sage Narada (exponent of Bhakti and Tantras): 3. Saints Nara and Narayana; 4. 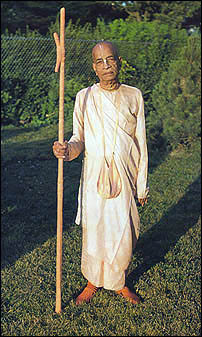 Sage Kapila (founder of the Samkhya System); 5. Dattatreya (the greatest magician who restored Vedic rites); 6. Yajna (Lord Vishnu as identified as the sacrifice); 7. Rishabha (founder of the pre-Aryan Jain philosophy); 8. King Prithu; 9. Dhanvatari, the founder of Ayurveda, (he came from the ocean of milk, holding the divine elixir; Amrith); 10. Balarama (came as brother of Lord Krishna, he is an embodiment of virtues); 11. Sage Veda Vyasa (author of the Vedas, Vedanta Sutras, and Mahabharata and the Bhagavatam); 12.Mohini (the Lord’s feminine incarnation) who deprived the demons of the divine elixir, Amrith. There are still more Avatars of Lord Vishnu which are not mentioned in the list above. Sometimes we hear it said that in Hinduism or Vedic culture there are millions of gods, even as many as 33 million. Yet, if we properly analyze the situation, we will understand that there is but one Supreme Being who expands into many aspects or many avatars, and who also has many agents or demigods who may represent Him and assist in managing the creation and the natural forces within it. And, like anyone else, if they are properly approached with prayer or worship, they may help facilitate the person by granting certain wishes that may be within the jurisdiction of that particular demigod. According to the Vedas, the demigods are not imaginary or mythological beings, but are agents of the Supreme Will to help administer different features of the universal affairs. They also represent and control various powers of nature. Thus, they manifest in the physical, subtle or psychic levels of existence both from within us and without. A transcendentalist sees that behind every aspect of nature is a personality. For example, when you walk into a big factory, you see so many workers and all that they are doing. You may initially think that these workers are the reason for whatever goes on in the factory. However, more important than the workers are the foremen, then the managers, and then the executives. Finally, a chief executive officer or president of the company is the most important of all. Without him there may not even be a company. You may not see the president right away, but his influence is everywhere since all the workers are engaging in projects according to his decisions. The managers and foremen act as his authorized agents to keep things moving accordingly. The numerous demigods act in the same way concerning the functions of nature. That’s why it is sometimes said there are 33 million different gods in Hinduism. Actually, there may be many aspects of God, but there is only one God, or one Absolute Truth. Almost any person [except maybe Jews] believes or utilizes an image or symbol of their religion, culture, or even business. This is not unusual. The Cross in the Christian church, the picture of Jesus Christ, the statue of Mary, statues of patron saints, even the black stone in Kabba are all what we could call images. If anyone bows in front of any of them, they are breaking laws of Old Testament. [LE 26:1, and EX 20:2-5.] Use of images is everywhere and all people worship something or someone. In fact, the first sculpture of Christ was in the form of a small boy holding a lamb. Now, everywhere in the world people have pictures of Christ according to their culture. A loving, young, white man in the USA, or a tough man looking like a judge in Russia, a nice black man in Africa, and you find a man looking like a typical Chinese with a sheepish beard in China. All religions have some concept of God with name and form, but Hindus have the courage to present the details as described in their scripture. The images and Deities of the Divine that are worshiped in the Vedic temples or in homes of those who follow Sanatana-dharma are not someone’s concocted imaginings. They are based on the detailed descriptions of God’s form as described in the Vedic texts. This is another beauty of the Vedic culture. Whereas most texts of other religions offer little information on God’s appearance and characteristics, these become specifically revealed in the Vedic tradition. Thus, we know what God looks like and can form images accordingly. Then these Deities are installed, calling the personality of the Divine, according to specific prayers and rituals. As the Supreme Controller, God can appear to His devotees in any of His specific forms. And even if some say that these images that are presented are made of nothing but stone or wood, still God can turn what is spiritual into something material, or something material into something spiritual. In this way, we can use our material senses and still have the vision of God in the form of the Deity, and approach Him with our love and service. Thus, the authorized Deity is not an idol, but is the Lord’s mercy in giving us the chance to see something spiritual with material eyes. Of course, as we become more spiritualized, we can see with our inner spiritual eyes the transcendental form and activities of the Supreme Being, even while in this body that we have now. An example is that the Post Office has authorized post boxes in which we put our mail, which is then picked up and delivered to the address on the envelope. If, however, we make our own unauthorized box and put it where we like, if we put our mail in it, it will not go anywhere. In the same way, by praying to the authorized forms of God our service will reach Him and be accepted by Him. Besides, there are many stories of how Deities have come to life and interacted with devotees and engaged in all kinds of pastimes with them in very personal ways. So they are always full of potential to interact with us, or merely watch and see what we do, or even leave the Deity form if we are too offensive or do not understand the basis of the Deity. So we should never think that Deities are nothing but stone or wood. In fact, the Vedic scripture says that anyone who thinks in such a way exhibits a hellish mentality. 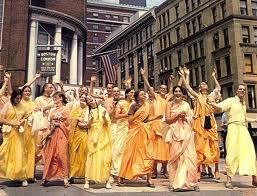 Most religious devotees of all religions are Bhakti-yogis, whether they believe in Hinduism or not. Very good Christians who go to church everyday and surrender themselves to the image of Christ are Bhakti-Yogis. 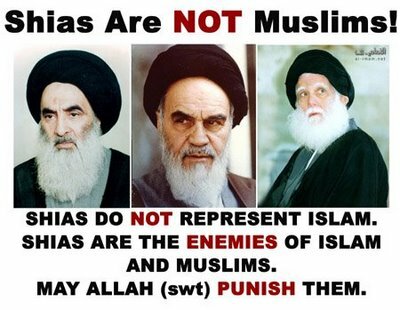 So too are devout Moslems. But Vedic culture is the only religion that explains the four paths in detail, especially the path of Bhakti or devotion, which can go much deeper in the Vedic process than ever described in any western or conventional form of religion. 6. Dasya Bhava (affection of servant for his master). 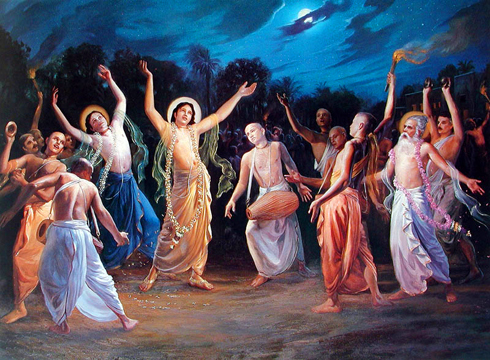 One of the great exponents of Bhakti-Yoga was the sage Narada. Narada states in his book Narada Bhakti Sutra: “A man who loves God has no wants nor any sorrows. He neither hates nor survives with a zeal for any ends of his own. 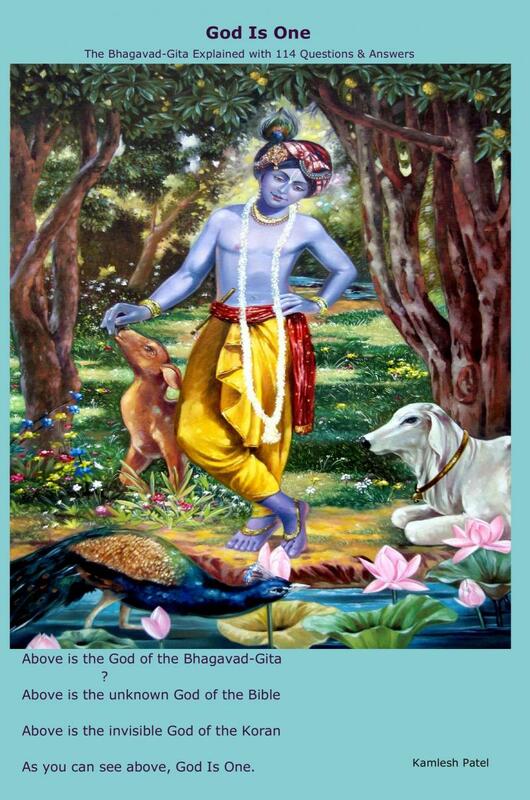 Through devotion he attains peace and is ever happy in spirit.” In the highest aspect of Bhakti-Yoga, the devotee goes for “total Self-surrender to the will of God.” All devotional books including the Bhagavad-gita advocate this Self-surrender. Lord Krishna promises in the Bhagavad-gita, that He himself will take the burden of taking care of the day-to-day problems of a devotee who has dedicated himself to God by surrendering his free will. This promise of God is repeated many times in the Gita, in different slokas. The theme of total self-surrender is often repeated in the Holy Bible, Koran, and other devotional religions. Like other yogas, in Bhakti-yoga the final goal is liberation. But in Bhakti-yoga, regaining one’s loving relationship with Lord Krishna is so ecstatic that it outweighs mere liberation from the pains and troubles of material existence. It provides a bliss that knows no bounds, if one dives deeply into it. 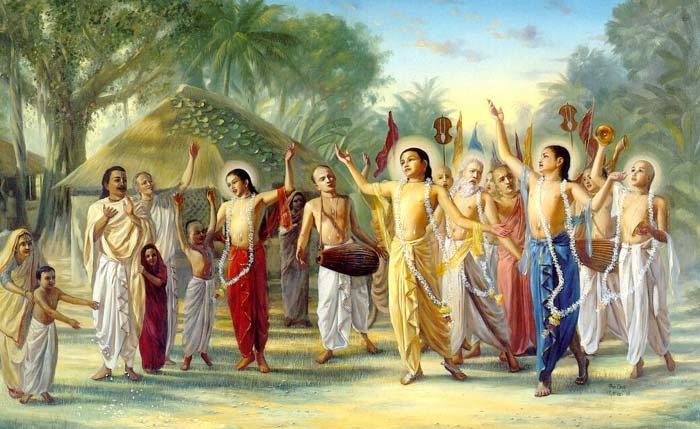 Great exponents of Bhakti-Yoga include several great saints who practiced it in India. A few of the very prominent ones are: Lord Chaitanya, Tulasi Das, and Meera Bai, the Six Gosvamis of Vrindavana, and many others. Karma-Yoga. The word karma is derived from the Sanskrit word Kri meaning “to do”. The word karma is used in many areas of Vedic philosophy. Here the meaning of karma is work. When we breathe, it is karma. When we think, it is karma. The actions we do accumulate karma and dictate our past, present and future. Karma is categorized by three forces. They are: Tamas, Rajas, and Sattva, which are the modes of material nature. Tamas represents inactivity and darkness. Rajas represents activity and passion. Sattva is the mode of goodness and light. Karma-yoga involves properly employing these three factors to raise the qualities of our activities. Karma-Yoga has a lot to do with Bhakti-Yoga and Jnana-Yoga. Chapters 3, 4, and 5 of the Bhagavad-gita explain Karma-Yoga. Karma-Yoga in brief is about attaining freedom through unselfish actions, “Nishkama Karma”. Selfish actions retard our goal. Unselfish actions take us towards our goal. So Karma-Yoga is the system of attaining freedom through selfless actions. Yoga - means union with the divine or salvation. Vritti - means modifications or vibrations. Nirodha - means stoppage or suppression or restraint. So according to Sage Patanjali, “The union with the Divine or salvation means stoppage of the vibrations or modifications of the mind.” In Raja-Yoga, a devotee uses meditation to try to achieve a state above the mind, free from all its dictates and interferences. It is very difficult to explain in simple terms, and thus it is rather difficult to use this system successfully in this age. The ordinary man whose consciousness is confined to the lower mind can conceive of only concrete images of objects, which are derived through the sense-organs. In a nutshell, for a perfected Raja Yogi, thinking is a voluntary process all the time, unlike most of us who think of so many things involuntarily. We think about the pros and cons of every issue, even if we do not want to think of them. This is the uncontrolled nature of the mind. Raja-Yoga is the process for attempting to control it. However, in this age of Kali-Yuga, it is not an easy process nor the most recommended. The Patanjali Yoga-Sutras consist of 196 slokas. In his book, Patanjali has never stated or mentioned that this is the only way for God-realization, so much so that the state of mind as well as God-realization which he expounds can be achieved by other religious practices also. Yama - means Abstinence from all vices. Niyama - means Observance of purity, contentment, etc. Asana - means a posture suitable for meditation. Pranayama - consists of prolonged expiration (Rechaka); Inspiration (Purakha); Retention (Kumbhaka) of breath. This exercise is supposed to be done only under the proper guidance of a realized master or Guru. In the Pranayama exercise, the devotee is supposed to control the vital currents in the body. Pratyahara - means retraction or withdrawal of sense-organs from sense-objects. Dharana - means the fixing of mind on any object. Samadhi - is the final state. He who meditates perfectly can attain Samadhi. In that state, the mind loses its complete identity and assumes a formless state, even though it can assume the form of any object it contemplates on. In Samadhi, it is expected that the devotee realizes the ultimate truth. Mantra-Yoga is another important form of yoga that is used in addition to the other major paths. It originated from the Vedas and Tantras. This yoga brings about changes in material consciousness by the agency of sound as found in the Vedic mantras and verses. Of course, the ‘sound’ that is referred to in Mantra-Yoga is the transcendental sound which you cannot hear merely by the human ear. It goes deeper to the soul. From modern science, we know three important facts: 1. Matter is an expression of energy. 2. This energy vibrates at different frequencies in different types of matter. 3. 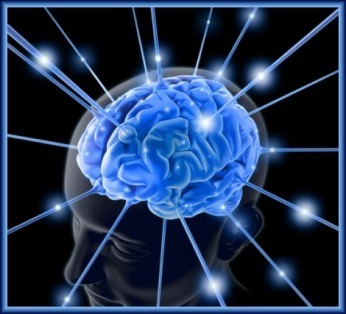 Our sense-organs can only receive sensations made in a very limited frequency-range. For example, we can hear only the sound produced in a limited-frequency range and anything above this range is called Ultra Sound and the sound below it is called Infra Sound. Of course, by no means can one conclude that the sound in Mantra-Yoga belongs to one of the categories above. We could say that Mantra-Yoga is based on the vibratory aspect of energy and its modifications into varied matter. Mantras are specific sound formulas that are used to bring about substantial results as well as the unification and unfolding of consciousness. Mantra-Yoga as such is not an exclusive form of yoga. Instead it is widely used by devotees who practice all other forms of yoga for spiritual upliftment and unfolding of consciousness. Mantra-yoga is actually a mystical tradition found in almost every spiritual path in the world. It may involve the softly spoken repetition of a prayer or mantra for one’s own meditation, or it may be the congregational singing of spiritually uplifting songs, prayers, or the sacred names of God. It all involves the same process, but in the Eastern tradition it is called mantra-yoga because it is the easy process of focusing our minds on the Supreme through His names, which helps spiritualize our consciousness. Man means the mind, tra means deliverance. Therefore, a spiritual mantra is the pure sound vibration for delivering the mind from material to spiritual consciousness. This is the goal of any spiritual path. Although all spiritual traditions have their own prayers or mantras, the Vedic mantras are especially powerful and effective in uniting us with the spiritual realm. However, a complete yoga process is generally a blend of a few yoga systems, such as bhakti-yoga with mantra-yoga. Therefore, bhakti-yoga also includes mantra-yoga, or the process of concentrating on the sound vibration within a mantra. This is especially important in this age of Kali. The mantra is thus a point of meditation for the mind, but also a formula or transcendental sound vibration, like the holy name of God, that releases its energy into one’s consciousness. Thus it prepares one for perceiving higher states of reality. With constant practice of the appropriate mantra, and with the proper pronunciation and devotional mood, the mantra can reveal the Absolute Truth to the practitioner as well as one’s spiritual form and relationship that you have with the Supreme Being. It is explained in the Vedic texts that in this age of Kali-yuga the process of chanting japa or mantra meditation is much more effective than practicing other spiritual paths that include meditating on the void or Brahman effulgence, or trying to control the life air within the body as in Raja-Yoga. Only a very few can become perfect at such things as raising the kundalini force up through the various chakras, or moving the life air up to the top of the head for full enlightenment and then have it leave the body at the right time to achieve liberation. And meditating on the void becomes useless as soon as there is the slightest distraction, which in this age of Kali-yuga is a continuous thing. Therefore, the most effective means of focusing the consciousness is to concentrate on the sound vibration of a mantra. The reason that chanting the Lord’s names is such an effective process is because the Lord and His names are identical: they are the same spiritual energy. 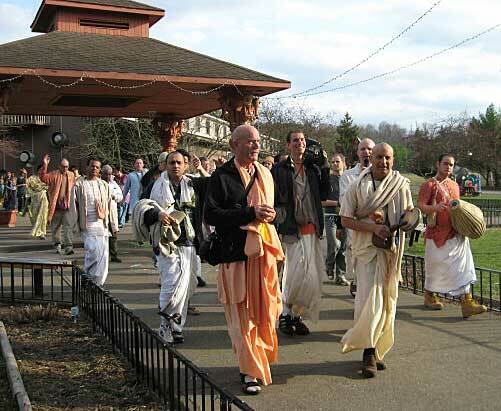 By chanting Hare Krishna we are in immediate contact with God. If we chant someone else’s name, we cannot enjoy their association because the name and the person are different. For example, by chanting “water, water, water,” we do not quench our thirst because water and the name are two different things. But in the spiritual world everything is absolute. 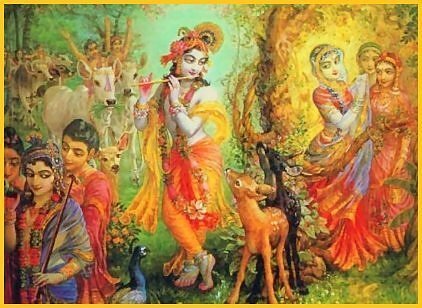 Krishna is nondifferent from His names and, therefore, we can feel His presence simply by chanting His names. This is further elaborated in the Caitanya-caritamrta (Madhya-lila, 17.131-133), which explains that there is no difference between the Lord’s name, form, or personality, and they are all transcendentally sweet. Krishna’s name is the same as Krishna Himself, and is not material in any way. It gives spiritual benedictions and is full of pleasure. But in the material world everything is different. Furthermore, in Caitanya-caritamrta (Adi-lila, 17.22, and the Padma Purana), the Hare Krishna maha-mantra is said to be the sound incarnation of Krishna, and anyone who chants this mantra is in direct association with Krishna and is delivered from the clutches of the material energy. It is also made of the letters AUM. There is a separate science in the use of it in meditation. [See my article “Meditation: A Short Course To Higher Consciousness” for a more complete explanation.] Briefly it represents the three states of consciousness (waking, dream and deep sleep), the Vedic trinity (Brahma, Vishnu and Shiva), the three main Vedas (Rig, Yajur and Sama), and the three worlds (Bhuh, Bhuvah and Svaha), as well as the beginning, middle and end of all that exists. Om is also called the pranava, which means that by which the Lord is praised. It is a name of God as well as the vibration that pervades the universe. By meditating on Om properly, one can enter the realm of transcendence to the highest Truth. But the proper way of meditating on Om is not as easy as one may think. Thus, the inner potency of the mantra is not so easily invoked. In brief, a guru is a spiritual teacher who is knowledgeable in the Vedic scripture and the traditions and can teach it to others. He or she is also experienced in the spiritual Truths, the goal of the Vedic path, and can show the way by example to those who enquire. 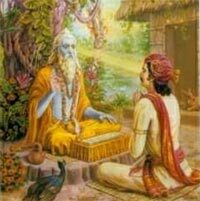 The word guru means one who is heavy with knowledge, not only cultivated knowledge acquired through personal training and practice, but also knowledge attained through personal experience and realizations of the spiritual perfection that is discussed in the Vedic scripture and by previous spiritual authorities. Such a qualified guru is one who should be approached with respect and served with humility and honor because such a guru who has seen the Truth can give one knowledge and guidance for attaining the Truth. Such a guru gives the second birth to a person into the spiritual understanding, beyond the common first birth one acquires from parents. Thus, a genuine guru can awaken a disciple to a new world of spiritual reality, a higher dimension. Such an awakening creates an eternal bond between the spiritual master and disciple. This section explains a few characteristics about which some people may question or feel are peculiar or strange. But in the Vedic system of Sanatana-dharma, everything has a purpose and meaning behind it, and reason why it is done. It is the popular greeting performed by pressing two hands together and holding them near the heart and bowing slightly while saying “Namaste”. The whole act communicates to the world the spiritual significance that “You and I are one”, or “I salute and worship the God within you, which is a mirror image of myself”. It is also called namaskar, which is understood as salutations or prostration, and a way of paying homage to each other. Its spiritual significance is negating or reducing one’s ego in the presence of another. The bowing of the head is a gracious form of extending friendship in love, respect and humility. Adding spiritual devotion to this gesture is done when we also add such sacred words as, “Namaste,” “Hare Krishna,” “Jai Sri Krishna,” “Radhe Radhe,” “Jai Sri Rama,” “Hari Om,” “Namo Narayana,” “Om Shanti,” “Om Namah Shivaya,” etc. These words are actually paying respect to the Divine, and certain sayings are often preferred in particular places. Thus, the Namaste gesture with these words does not remain a superficial gesture but provides a deeper communication and meaning between one another. The tilok marks that may be seen on devotees and Hindu saints are usually in two forms: applied in a V shape in the center of the forehead, or as lines applied horizontally across the forehead. It will vary in design according to the sect of the person. A simple tilok in the V shape may be white or dark, using chandan or clay from certain holy places, or sandalwood paste. These indicate that one is a Vaishnava, or worshiper of Vishnu and Krishna. Or it may have a red streak down the center that indicates that one is a worshiper of Lord Rama. Or it may be the three-lined sacred ash, called bhasma, streaked horizontally across the forehead that indicates one is a Shaivite, or worshiper of Shiva. A simple red dot is also worn by those who worship Devi. Other shapes and colors will indicate other purposes. Sometimes you may even see a holy man whose entire forehead is covered with chandan or bhasma tilok. Such marks may be applied as part of the morning ritual or custom with a mantra or prayer, or the kumkum or chandan are often offered by a temple priest to the guests who visit the temple after it has been offered to the temple Deity. Among other things that it indicates is that it marks the body as a temple, a vehicle with the soul and Supersoul within. So it helps invoke a feeling of sanctity in the wearer, and reminds others of the spiritual significance of who we are. The tilok also covers the spot between the eyebrows which is the seat of memory, thinking and the third eye, or spiritual center of consciousness, the Ajna Chakra. The tilok is said to help activate that center. It is also said to help cool the forehead against heat generated from worry that may also cause headaches. Thus, it protects us from energy loss. However, the tilok marks are also applied to other parts of the body, such as the arms, chest, and back, all of which are to indicate the sacredness of the soul within the body, or the holy aspect of the body when it is used in the service of the Lord. The holy ash, bhasma, is not any ordinary ash, but it is the remnants from the homa or sacred fire into which special wood, ghee and other herbs have been offered as worship of the Divine. 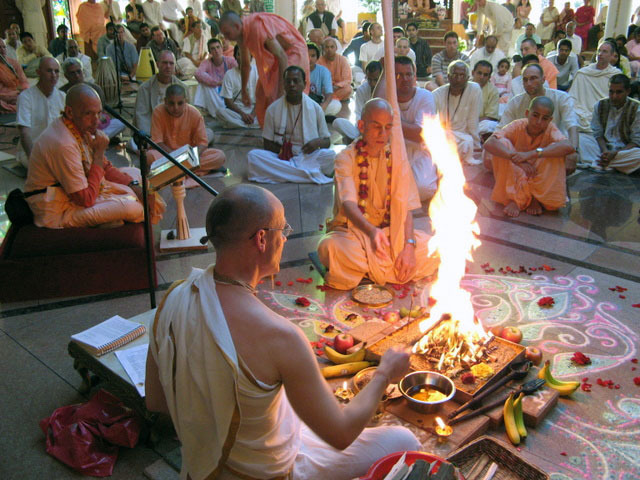 Homa also signifies the offering of the ego and material desires into the flame of knowledge. Sometimes the Deity is worshiped with ash which is then distributed as bhasma. So the ash, that is applied to the forehead as well as other parts of the body, indicates purity of mind, or the attempt to attain it. It also indicates the destruction of the false identity of the body which brings freedom from birth and death. Some ascetics, such as austere Shaivites, will rub it all over the body. This also keeps the body somewhat warm, especially for the Naga Babas who may wear little or no clothing, but undergo whatever nature brings their way. Shiva also smeared it all over his body. When the ash is applied to the forehead with a red dot in the center, it indicates a unity of the Shiva-Shakti principle. The word bhasma means “that by which our sins are destroyed and the Lord is remembered”. So it indicates the destruction of evil and the invocation of the Divine. It is also called vibhuti (which means glory) and raksha (which means source of protection). Shanti means peace, a natural state of being that everyone wishes to reach. Peace is naturally experienced when all agitations end. The most important peace is to attain it within the mind, internally. So in many mantras, or at the end of many prayers, shanti is said three times because it is believed that anything said three times with enough focus or concentration will manifest. It is also to emphasize something. So when shanti is chanted three times, we first say it loudly, then softer, and then more softly. Many devotees and Hindus will make space for a prayer room in their homes. These are meant to have their own sacred atmosphere and will contain holy pictures, prints, utensils, Deities or images, lamps and burning incense. Nothing is to be done in this room without a spiritual purpose. Thus, the atmosphere in the room never becomes contaminated by any other activity or selfish consciousness. It has its own special atmosphere. Thus, it becomes a means to get away from everything else, or free from the common thoughts of the day. In this way, it is easy to enter into meditation or engage in chanting japa for mantra meditation or worship of the Deity, offering prayers, or sing bhajans, without other thoughts causing distractions. Such a room also indicates that the Supreme is the proprietor of the house, and our very lives, whom we respect and honor in this way. Therefore, this is the way that we continue to live our spiritual life whether we go to a local temple or not because we have made our own house into a temple. So we commune with God and invoke His grace everyday and on special occasions in the prayer or temple room of our house. Sometimes it is thought that Hindus can marry more than one wife. But Hindus practice monogamy. Even in ancient times it was only the Kshatriya kings who would have more than one wife because with his wealth he could take care of them properly. However, that is a thing of the past. Today in India, it is the Muslims who are allowed to have more than one wife according to their own Sharia or Islamic laws, which is what can create confusion about whether all Indians can marry more than one wife. 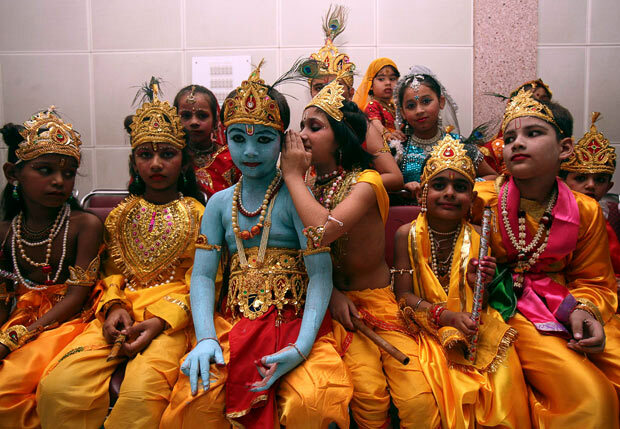 In regard to marriage, sometimes it is thought that “child marriages” take place in Hinduism. But such is not meant to be the case. In fact, a law was passed in India by the SAADA Act (1929) under the British to make sure that such things do not take place. Again, it is the Islamic Sharia law that allows for child marriages for Muslims in India. However, villagers in India are often hesitant to adopt modern laws, so it may be perceived that Hindus in India still practice the marrying of children. 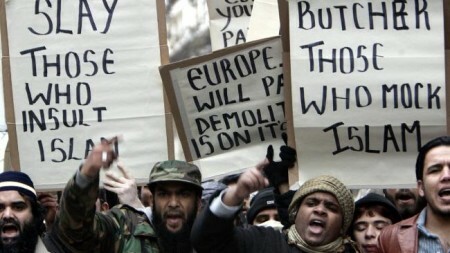 But Muslims can and still do this under their own laws. Hindu scriptures also forbid abortion. Various references in the Vedic scriptures actually pray for the protection and well-being of the embryo and bless the parents who can take care of such a child. There are prayers in the Rig-Veda to guard a growing embryo. In the code of Manu, Manu forbids abortion. One of the worst acts described in the scriptures is Sis-Hatya, meaning destruction of the unborn fetus. There are other verses that describe the punishment of those who put an early end to the child in the womb. Plus, from time immemorial, Hindus consider children as gifts from God. The only time abortion is allowed is when the fetus is known to be defective as per Susruta Samhita, the Hindu Ayurveda book. When entering a temple, most of them have one or more bells hung from the ceiling. The devotee rings the bells as he or she enters, then proceeds for darshan to see the Deities. The ring of the bell produces a sound similar to Om, the universal name of the Lord. This helps create an atmosphere of auspiciousness when entering the temple. This is also a reason why a bell is rung by a priest, pujari, while doing the arati ceremony. Ringing the bell, blowing the conch, and engaging in the kirtanas or singing holy songs, are all ways to worship the Lord and keep away all inauspicious and irrelevant noises and thoughts that might disturb or distract the worshipers from their devotions and inner peace. In many homes and temples there are lamps that are lit. And many special functions start with the lighting of a lamp. Light symbolizes knowledge which keeps us free from the darkness of ignorance. Knowledge removes ignorance just as light removes darkness. Therefore, the lamp is lit and we bow to it as this knowledge is the greatest form of wealth. It is kept lit during special functions as a guide and witness to our thoughts and actions. Of course, now lamps are not as necessary with the use of electric bulbs, etc. But the lamp is the traditional instrument which represents our vasanas or negative inclinations, while the wick signifies our ego. As the lamp burns, it also represents the burning away of our bad habits and bodily ego. The flame burns upward, as knowledge also takes our views higher. Whether in temples or in our household temple rooms, the conch shell is blown three times before the arati ceremony or puja, worship. It is kept on the altar as a symbol for Truth, dharma, auspiciousness, and victory. It also was blown before a battle or after the victory of an army. Blowing the conch emanates the sound of Om, which contains all the knowledge of the Vedas. It is an auspicious sound and represents the truth behind the illusion. It also can purify the atmosphere, as well as the minds of those who hear it. It also represents dharma or righteousness. So it is appropriate for it to be blown before the arati or puja. The sound of the conch draws one’s attention to the presence of the Lord and the Vedic sound vibration. It thus drowns out the negative noises that may distract us from the sacred atmosphere or disturb our minds. This is also why sometimes devotees bow to the sound of the conch when it is blown. The tradition relates that there was once a demon named Shankhasura who had defeated the devas (demigods) and stole the Vedas from them. He then hid at the bottom of the ocean. The devas prayed to Lord Vishnu for assistance. He incarnated as Matsya and killed the demon. The Lord blew one of the conch shells that hung from His ears and the Om resonated, from which the Vedas returned. For this reason the conch is also called shankha after Shankhasura. The Lord’s conch shell is named Panchajanya. One of the most common items that are offered to the Deities in the temple is the coconut. You will also see it being used to start special occasions, like weddings, festivals, etc., when it is offered and then broken. You may also see it sitting on top of a pot with mango leaves. This is a representation of Lakshmi devi, the goddess of fortune, or sometimes Lord Shiva. The coconut is offered to the Deity as a representation of the body (the coconut shell), mind (the white fruit) and soul (the milk). All these are offered to the Deity, and then it is broken to let out the milk and fruit. This indicates the breaking of the ego. Then, after it is offered to the Lord, what remains is accepted as remnants from the Lord, as prasada. This represents a complete circle in which God accepts our offering of the body, mind and soul and gives back the mercy, prasada, of the Lord. Another thing that you may see is when devotees circumambulate and go around the Deities in the sanctum of a temple, or even around the temple itself, or around sacred places, like special hills or even holy towns. This is called pradakshina. This is a means of recognizing the center point of our lives, the center of the circular path we take in honor of the Deities of the Lord, or something connected with Him. This is done in a clockwise manner so to keep the Deity on our right, which is the side of auspiciousness. So in a way, it is a reflection of going through life while keeping God in the center. 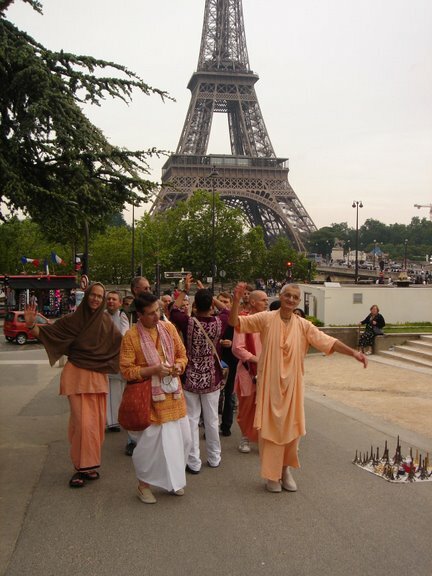 Walking around holy sites is another way of undergoing austerities for spiritual merit. It is accepted that each step takes away some of our material karma, and thus helps us get free from the mundane affairs and worldly consciousness which causes us to undertake the actions which create our karma, which helps free us from further rounds of birth and death. Respect can be shown to our superiors or parents by circumambulating them three times as well. We often see that food preparations are offered to the Deities during the worship. Or even in homes of devotees, food is prepared and then offered to the Deities in the family temple room before anyone else accepts it. Then it is taken as prasada or mercy of the Deities or God as spiritualized food. Even in many western homes food is taken only after observing a prayer. This is a recognition that whatever blessings we receive in life is a result of the Lord’s arrangement. After all, everything is God’s property, and we are merely borrowing it. So we offer to God whatever we accept before taking it ourselves. We can especially do this with food. Furthermore, it has been detected that the particles of food change when prayers are said over it. So offering the food increases the high level of energy that goes into it that would otherwise not be there. Sometimes, especially during a homa ritual, there is a special pot or kalasha, topped with a coconut, that is given special attention. The pot may be made from brass, copper or mud, and filled with water. Tied around its neck may be a red and white string. The pot often has designs on its sides. It may be used for special occasions like weddings, or set near entrances of homes, etc. 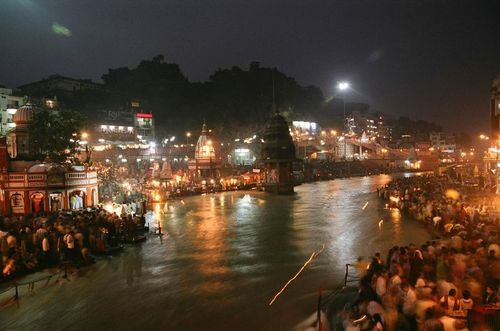 The water in the kalasha symbolizes the waters of creation when the cosmic manifestation appeared with the arrangements of Lord Vishnu and Brahma. The leaves and coconut represent the creation, while the string indicates the love that is the foundation of the whole creation. When prayers are offered to the kalasha, it is considered that all the holy waters, the Vedic knowledge, and the blessings of the Deities are invoked in it. The purified water within is then used in the rituals. At other times, the prayers are used to invoke the energy of the Goddess of Fortune, Lakshmi Devi, and the kalasha becomes a representation of Lakshmi. Respect for plants and the resources that we depend on is a basic premise of the Vedic culture. In fact, one of the ways of doing social service is to plant trees for shade along the paths that people regularly use. Another point is to use only as much of the plants or trees that is needed, whether it be for food, shelter or fuel. Indeed, cutting trees unnecessarily is considered a sin or way of accumulating bad karma. So respect for trees is naturally a part of the Vedic path. In fact, some trees have such good medicinal qualities and benefits that they remain highly regarded till this day. However, there are some specific plants that are given more respect for particular reasons. The tulasi tree is very special. It is not unusual to find it in many temples in India in the courtyard, or even in homes. In fact, it is considered a part of worship to take care of it, water it and circumambulate it. The whole plant, and even its soil, is considered sacred. A leaf from the tulasi plant is placed on the food that is offered to Lord Vishnu or Krishna. It is His favorite tree. The tulasi is considered an incarnation or expansion of a pure devotee of the Lord. This is based on a long traditional story in the Vedic literature. She also symbolizes Goddess Lakshmi, and once a year there is the festival of the marriage ceremony between tulasi and the Lord. This is because the Lord also blessed her to be His consort. So the worship of the tulasi tree is a part of the devotional service to Lord Krishna and Vishnu. The lotus, besides being India’s national flower, is a symbol of truth, beauty and auspiciousness. The Lord is also compared with these principles and its beauty. You can easily find it in many parts of India adorning ponds and lakes. The lotus grows out of the water but raises above it. It remains beautiful and untainted regardless from where it grows. In this way, it shows that we too can remain unaffected by the world of trouble and doubt around us. The Vedic literature has numerous references to the beauty of the lotus, and it is a common architectural motif. Lord Vishnu and Goddess Lakshmi both carry a lotus in their hands. A lotus also emerged from the navel of Lord Vishnu during the process of universal creation, from which Brahma originated. Thus, the lotus also indicates the link between the Creator and the creation. So the lotus is highly regarded. Devotees sometimes fast on certain and special days. This sort of fasting is called Upavaasa, which means to stay near. This is in regard to staying near the Lord in mental disposition by spending more time in thought of God without using the time and energy in procuring items of food to prepare, cook and eat. Food does certain things to us according to its quality. Some of it will heighten our awareness while other types may indeed make our minds clouded and dull. So on special days, a devotee may save time and conserve energy by either eating very simple and light foods, or even by not eating at all. Thus, one’s mind can remain alert and absorbed in thoughts of God, and not be pre-occupied thinking of what to eat. On a more mundane level, it is also a way of giving the body and digestive system a break, and letting it get cleaned out. Fasting also helps bring control and discipline over the senses and calms our mind. However, fasting for some other reason based on ego or politics will not bring the same results. And one should not become unnecessarily weak by long fasts. This can become counterproductive in keeping the mind and senses equipoised for developing meditative spiritual awareness and love for God if we become too weak, or focused only on desiring food to eat. Lord Krishna advises us in the Bhagavad-gita that we should take the middle path of not eating too much nor too little, but to eat purely, simply and healthily for keeping body and soul together for spiritual purposes.